Today is Free RPG Day! Participating hobby game retail locations and industry publishers will be giving away free adventures and other materials so that gamers can try new games and play exclusive content together. This year Paizo has contributed three special products. 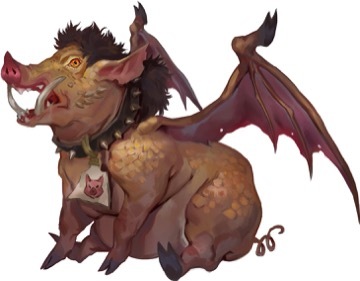 The first thing we're providing is the next adventure in the We Be Goblins series featuring the hijinks of Chuffy, Mogmurch, Poog, and Reta—Pathfinder Module: We Be 5uper Goblins by our own Crystal Frasier. The brainstorm meeting for this adventure was easily one of the funniest meetings I've ever attended, which was super welcome because we'd all had a few really stressful weeks at that time. Here are a few words from Crystal about her zany adventure. "Goblins win! Goblins reign! Goblins venture ‘cross the planes! There's not a lot our intrepid goblin hero-chiefs—Reta, Chuffy, Mogmurch, and Poog—haven't done at this point. They've conquered vicious halflings, slain literate cannibals, bested ogres, and battled terrifying harpies! They've grown from mere whelps to big bad hero-chiefs! What's left? Maybe travelling the planes and fighting a vicious dragon? We Be 5uper Goblins is the capstone for the We Be Goblins series, dropping everyone's favorite anarchists into a strange new setting where they need their wits and strong stomachs to survive. 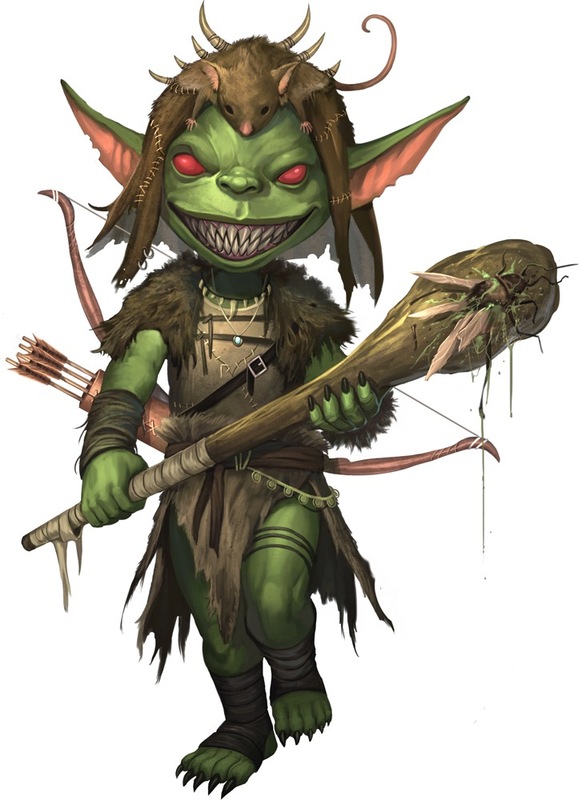 Goblin adventures are always fun to write, because you can play with weird, fun ideas and bend the rules more than you can in a typical Pathfinder adventure, so I'm always happy when they come around. It turns the typical adventure dynamic on its head; you assume, on some level, that adventurers because they want to do "good" and they want to get rich. But goblins adventure because they want to do "crime" and get fed! Those two simple words open up lots of weird, fun new encounters, and I hope your players utterly break the narrative presented in this book for this year's Free RPG Day! I know mine did." 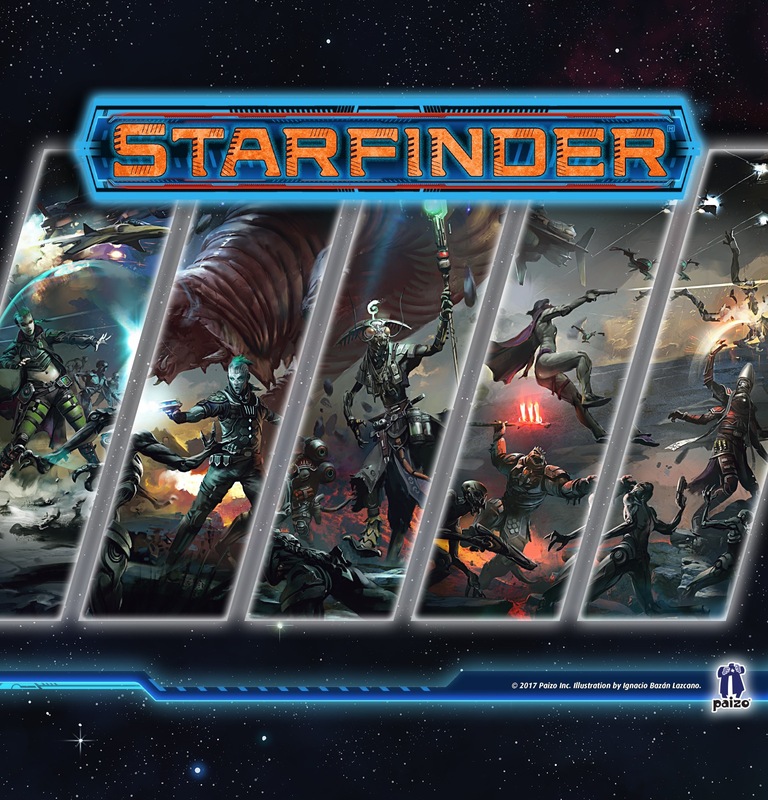 The next exciting thing you'll find at your local retailer is a short adventure for Starfinder—Starfinder Module: Skitter Shot, featuring the colorful, lovable, and helpful six-armed skittermanders. Our own Jason Keeley wrote this adventure, and I tracked him down in the far reaches of space to get a few words about his adventure. "Hihello, nufriends! 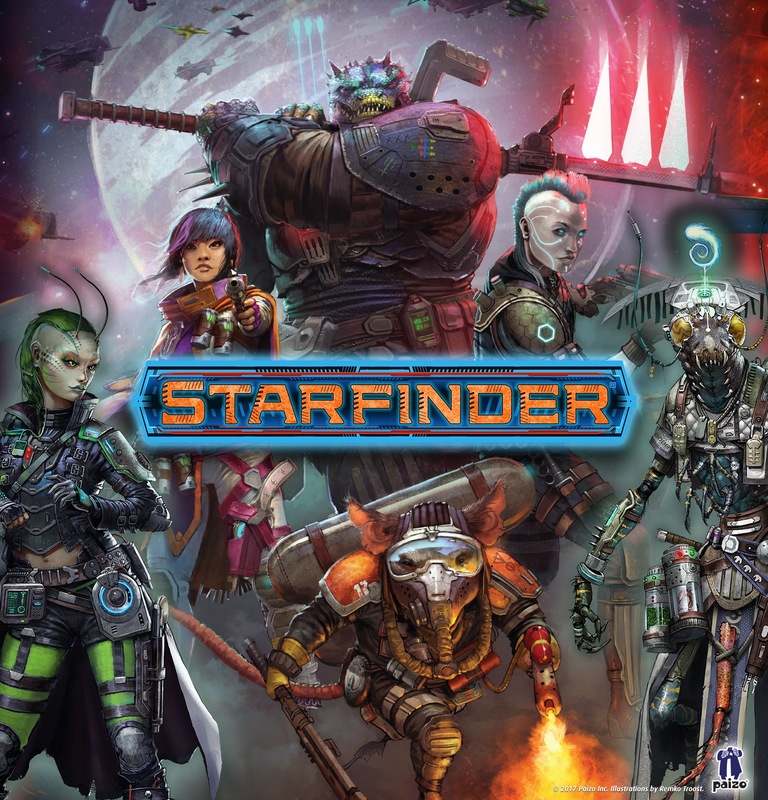 Today, you'll finally be able to get all of your hands on Starfinder's Free RPG Day offering,Skitter Shot and see what happens when you point a quartet of skittermanders at a problem and say, "Go help!" The four fuzzy friends will need to work together to defeat a rogue artificial intelligence aboard a luxury cruise ship, and will hopefully come out the other end with all their limbs intact. When we decided skittermanders would be the focus, we took the opportunity to not only give you a fun and wacky adventure, but to illustrate our vision for the hyperactive creatures. 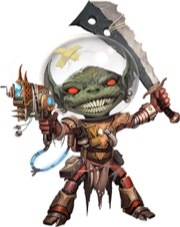 Since they appeared in Starfinder Alien Archive, skittermanders have certainly captured most everyone's imaginations! 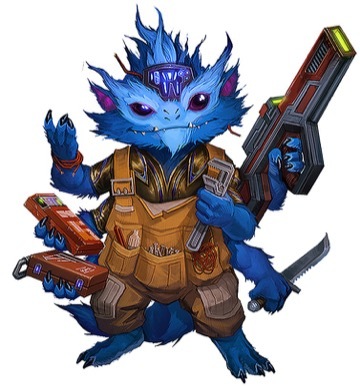 And so, to further stoke those fires, Skitter Shot presents detailed backstories of the four skittermander pregens, each with a fun piece of skittermander slang that you can work into your everyday Starfinder conversations. But that's not all, the inside back cover of the book features a list of ten fun facts about skittermanders that will give you insight into their society and personal relations. Like any good skittermander, WE only want to help YOU." 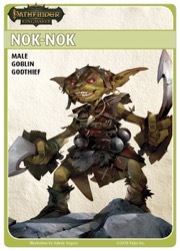 Lastly, players can add some ferocious goblin fun to their to Pathfinder Adventure Card Game with Nok-Nok. This fully playable character, complete with role and token cards, will be released for Free RPG Day 2018. 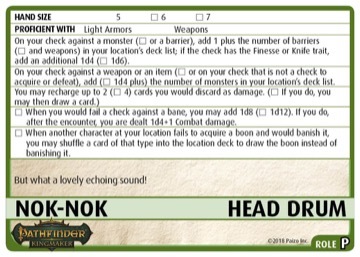 Nok-Nok may be used with any Pathfinder Adventure Card Game set. As in past years, the new Free RPG Day module is also sanctioned for the organized play campaign, and we've released the sanctioning document so that GMs have a chance to read over it and print out Chronicle sheets. You can find links to these downloads on the product pages, but we've also gathered them here to make things easy on you. 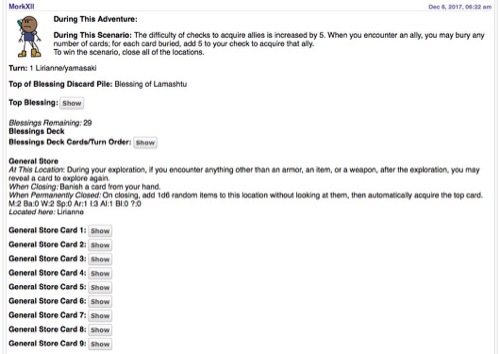 If you're planning on playing the adventure, it's best to not check out the sanctioning documents. No one wants spoilers! Did you oversleep and miss getting your hands on our offerings for Free RPG Day? Were you not able make it down to a store? Were no retailers in your area participating in this awesome day? Don't fret! Physical copies of the adventures and the Nok-Nok card will be available for purchase here on paizo.com starting on July 1st, which is also the same time that you can come back here and download a free PDF of the adventures. We hope everyone has a fun-filled Free RPG Day! 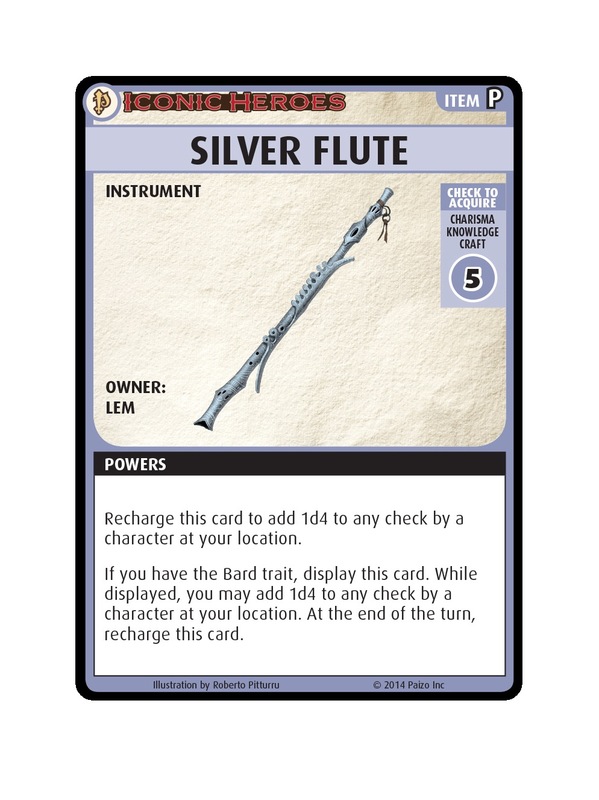 Pathfinder Adventure Card Game fans! If you're going to be in the Columbus area over the next four days, please come visit us at the Origins Game Fair—there will be lots of PACG to play! You can find me hanging out with PACG developers Keith Richmond and Paul Peterson at the Lone Shark Games booth, #235. Paul and I will also join James Ernest for our annual Origins by Night podcast every night of the show from the Big Bar on 2, just a few feet from the Pathfinder games. Come say hi! We'll also be bringing a copy of the playtest set for next year's PACG Core Set. I don't know how many games we'll be able to get in while we're there—there's a lot going on at the show—but whenever we have time, we'll bring it over to the PACG area and playtest with you. 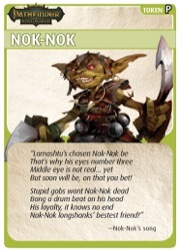 A while back we revealed Nok-Nok, our fifth goblin promo character for Free RPG Day. That's an annual event where gamers around the world play hobby games all day long. More than a dozen companies provide free products for participating retailers to give out, and Paizo is no exception. In addition to the modules We Be 5uper Goblins! 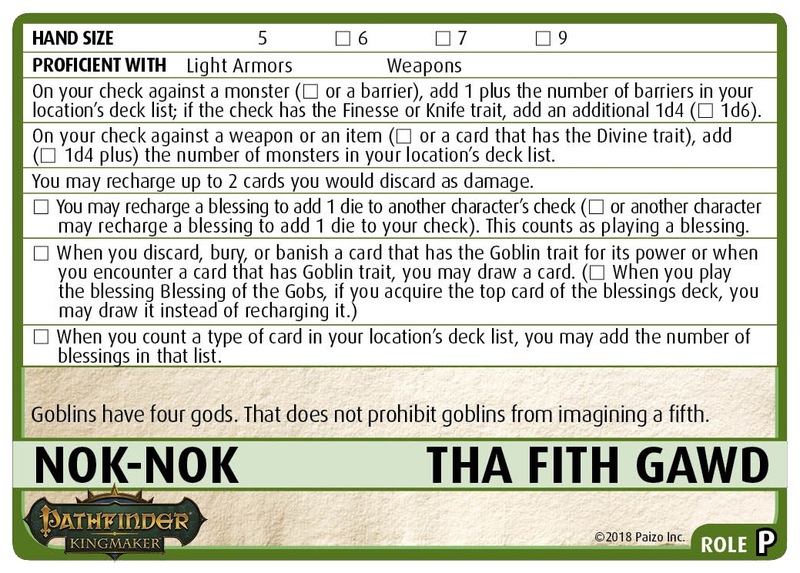 for the Pathfinder RPG and Skitter Shot for Starfinder, we've got Nok-Nok for PACG. Nok-Nok is from the upcoming Pathfinder: Kingmaker CRPG. My birthday-twin Chris Avellone wrote a bunch of stuff for that game, and so we wanted to honor him by including Nok-Nok in our world. Here's Nok-Nok in all his glory. When someone asks you if you're a god, you say yes. We especially like the central mechanic on Nok-Nok: that he cares how many of what are in his location deck. Sure, every character does. But Nok-Nok is especially good at gaining value from cards that aren't even flipped over from the location deck yet. It's kind of awesome to watch. 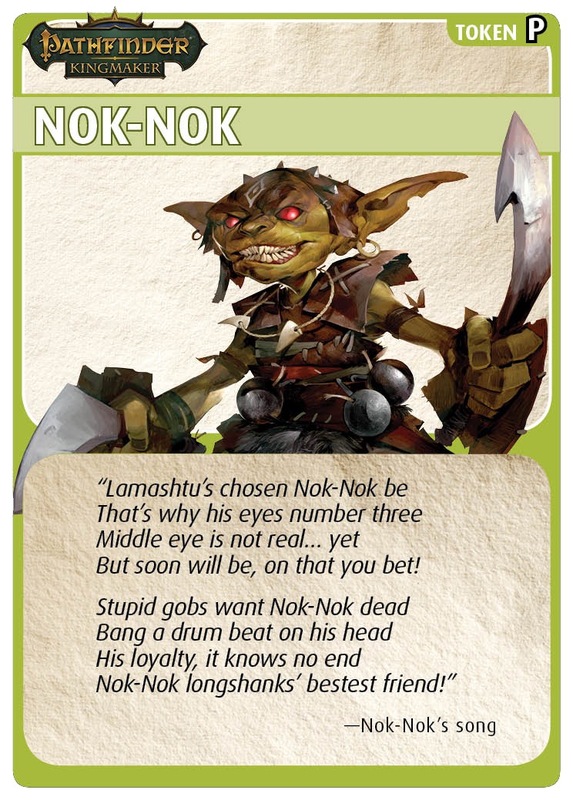 Also, Nok-Nok may not be every goblin's goblin. The other goblins use his head as a drum, which does not endear them to Nok-Nok. If you want a goblin to solo through the first adventures in Rise of the Runelords or Season of the Runelords, Nok-Nok's your man. Er, goblin. If you can't get your hands on Nok-Nok on Free RPG Day, don't fear! We'll be sending him out for free along with PACG subscription shipments of Ultimate Wilderness in July; non-subscribers will be able to purchase him from paizo.com starting August 2. We're hoping to see you at Origins and on Free RPG Day! Thanks for playing! 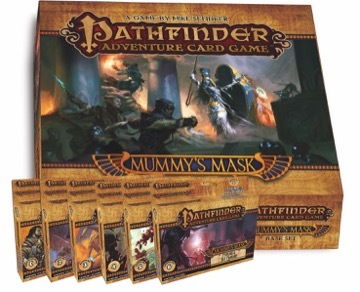 It's hard to believe that the Pathfinder Adventure Card Game was released almost five years ago now. The game has evolved through four full base sets and dozens of character and add-on decks, and has been the focus of a successful organized play campaign. Before we get into this week's blog, we have a couple of things we want to share with you! First, we have a massive Pathfinder Adventure Card Game sale running through April 30. You can get complete PACG Adventure Paths—the Base Set, all 5 additional Adventure Decks, and the Character Add-On Deck—for the price of the Base Set alone. Choose the Skull & Shackles Collection, the Wrath of the Righteous Collection, and the Mummy's Mask Collection! You'll also find the first 19 Class Decks (up through Warpriest) on sale for 50% off through the end of the month! Nok-Nok's PACG incarnation will initially be available for free at stores participating in Free RPG Day on June 16. 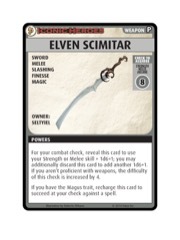 We will then send him free to subscribers of the main Pathfinder Adventure Card Game line alongside the Ultimate Wilderness Add-On Deck in July. After that, he'll be available for sale on paizo.com and at our Gen Con booth in August. Now, I'll cede the floor to Tyler "Cartmanbeck" Beck, our new Venture-Captain for Pathfinder Society Adventure Card Guild Online Play! Tyler: It's hard to believe that the Pathfinder Adventure Card Game was released almost five years ago now. The game has evolved through four full base sets and dozens of character and add-on decks, and has been the focus of a successful organized play campaign. 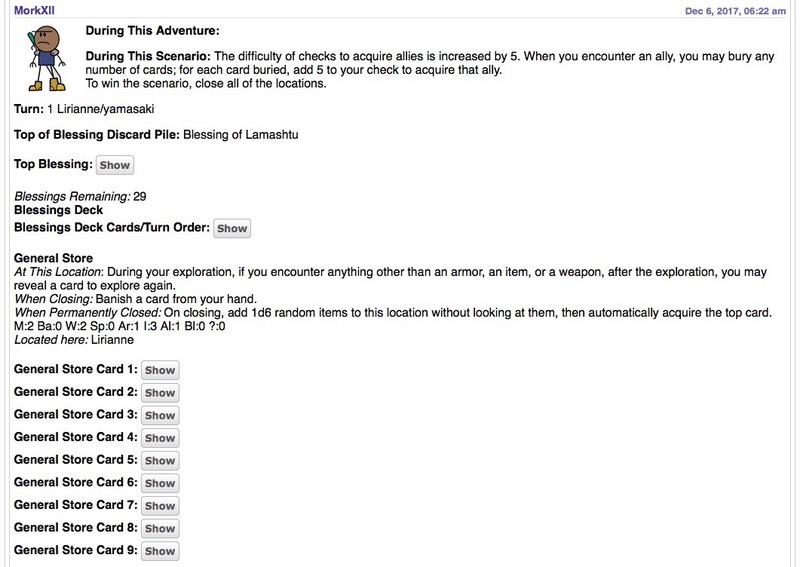 Speaking of that organized play campaign, in the recent 5.0 release of the Pathfinder Adventure Card Guild Guide, the option was added for online play. I know a few people have been asking things like "What?" and "How?" and "Really?" Thus far, the answer to all of those questions has been "Let's take it slow." So to that end, the Card Guild has become a (relatively small) part of the OutPost play-by-post gaming convention, currently being held right here on the Paizo forums. We've currently got 11 tables running currently, with several box runners (BRs) each running one or more tables of PACG newbies and veterans alike. I'd like to introduce you to two BRs who will tell you a bit about how things work. Ray (redeux on the forums): Most of my experiences so far have been as a player at one of the play-by-post tables. It's been a blast! Five of us has been working through Season of the Runelords, and over the course of several months we've progressed all the way to tier 5. I'm fortunate enough to also have a local group that gets together for organized play, but what I like about the online play-by-post is that it can be done from anywhere, and it takes much less time out of my day spread throughout a week rather than all in one afternoon. In that regard, it has been super convenient to get a little dose of PACG on a regular basis without straining my schedule. The format also makes it easy to back to look back and check what happened, like that time Kyra unleashed a fire attack with her sword, making sure her fire-loving goblin teammate Reta was nowhere in sight so she wouldn't get any heated ideas. With the OutPost event, we have been working hard to expose more people to the play-by-post format for PACG. I'm currently running two tables for the event, and I have players from the US, UK, Asia, and Australia, which shows that the game can be played globally. Some of my players are fairly experienced with the ACG, other players have a lot of experience with the RPG but little ACG, and a few started with little to no experience with either. We all work together to help everyone learn and overcome the scenarios! The scenario post has all of the "During this Adventure" and "During this Scenario" text in it, as well as turn info, blessing deck info, and location/location deck info. 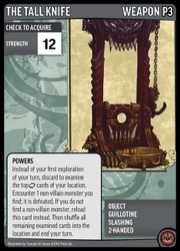 All of the cards in the location decks are hidden through spoilers. This allows players to explore multiple times in their turn without waiting for a new card to be presented to them. Players use a Deck Handler spreadsheet on Google Docs that handles drawing cards from your deck, discarding, recharging, burying, shuffling, etc. (Tyler provides some instruction on how to use it here. 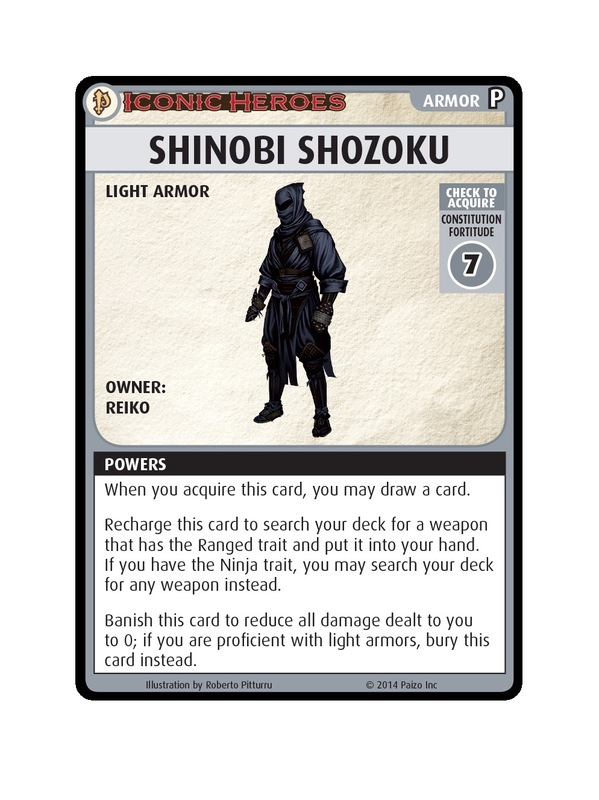 The Deck Handler includes only card names, so you still need to have a physical deck to reference the card text. It provides an easy way to let everyone know what cards you have in hand, and what blessings or other cards you are willing to let people use on their turns. When you finish your turn, it gives you templated text to paste into the forum to communicate your decisions. Mark (MorkXII on the forums): During last year's online runthrough of the Cosmic Captive PFS Special, I was able to join one of two ACG tables run during the event and had an amazing time, and I couldn't wait to do it again. When I missed the chance to play in a Season of the Goblins game> that Tyler started in November, I asked him if I could run my own table. He agreed, so I recruited four players (and a fifth joined later) to play through Season of the Runelords. That campaign is still going: the group has finished 23 scenarios in roughly 100 days, and we're on track to finish the entire Adventure Path by the end of OutPost on April 30. Playing the ACG by forum post is obviously not the same as playing in-person: the pace is much slower, and sometimes it's tricky to collaborate on group efforts, such as who's handling temporary closes and multi-check encounters, and who's supplying all the blessings. Some rules and scenarios are a little tougher to implement for forum play and take an extra bit of effort or creative thinking (I'm looking at you, Adventure #2-3C!). But overall the game still works well in this format, and the slower pace also means you spend more time getting to know the group than you would around a table. Early in our Season of the Runelords game, we moved most of our game discussion to a Google Hangouts chat to allow for more real-time discussion. This made it easier to plan out those group efforts, but also enabled more off-topic and personal discussion, and it's been wonderful getting to know some other Pathfinder fans from around the world. The slower pace of play also means that everyone has more time to take their turns, and many players put in effort to go beyond just listing what cards they encounter and play. The roleplaying and storytelling are my favourite part of playing a game online because it's so entertaining to read! When Reta fell into a giant pit and dragged all her goblin friends along with her, it made for a series of very fun posts. And a different Reta seemed very pleased with herself when she clubbed the villain over the head with a Lamia henchman. (At least she didn't offer anyone any of her... questionable pickles that time). And playing online, you still get the same exciting moments that you always get from Pathfinder. Who doesn't love clearing out an entire location deck in a single turn? Or blasting away the villain on a last-ditch effort with just one blessing left in the deck? Tyler: We have a vibrant community of players on the Paizo play-by-post forums, and I'm excited that we've been able to add Pathfinder Adventure Card Game play to that community. As OutPost winds down at month end, watch for new developments on the forums and more ways to play PACG in play-by-post form yourselves! Happy Free RPG Day! 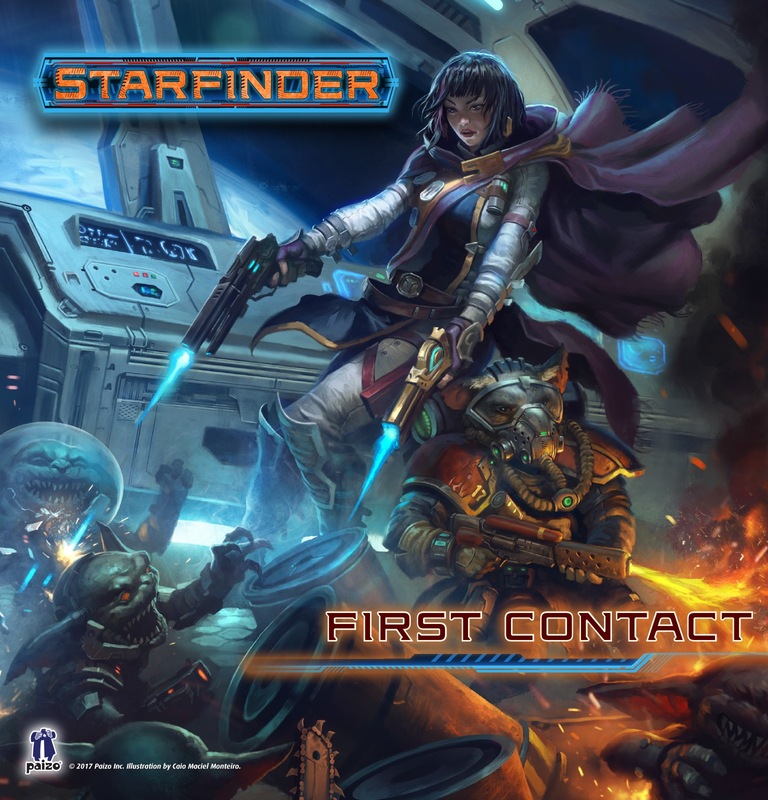 Today at participating game stores, you'll be able to pick up your own copy of Starfinder First Contact and the new Pathfinder Adventure Card Game Character, Reepazo. We've also released a new Chronicle sheet for Pathfinder Society Roleplaying Guild members participating in the event. You'll be able to find copies of First Contact and Reepazo later this summer on paizo.com if you can't make it out to your local store, however. 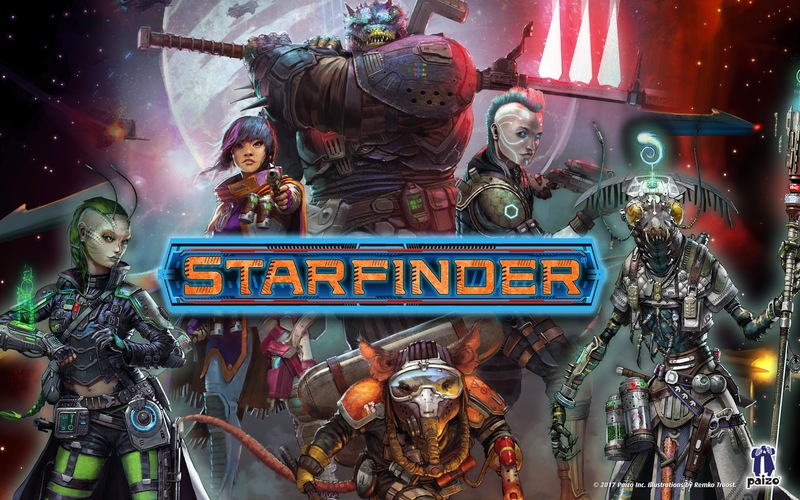 Enjoy the day, some new Starfinder wallpapers to trick out your devices, and keep an eye on the Paizo twitter, where Outreach Coordinator Dan Tharp will be live tweeting this afternoon! Happy Free RPG Day! 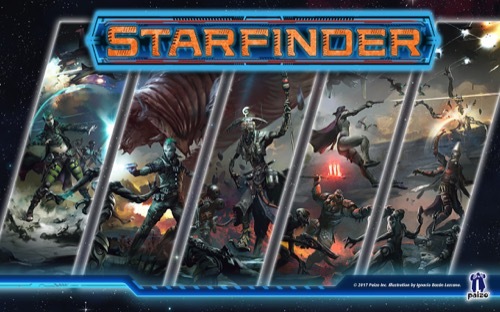 Today at participating game stores, you'll be able to pick up your own copy of Starfinder First Contact and the new Pathfinder Adventure Card Game Character, Reepazo. We've also released a new Chronicle sheet for Pathfinder Society Roleplaying Guild members participating in the event. You'll be able to find copies of First Contact and Reepazo later this summer on paizo.com if you can't make it out to your local store, however. 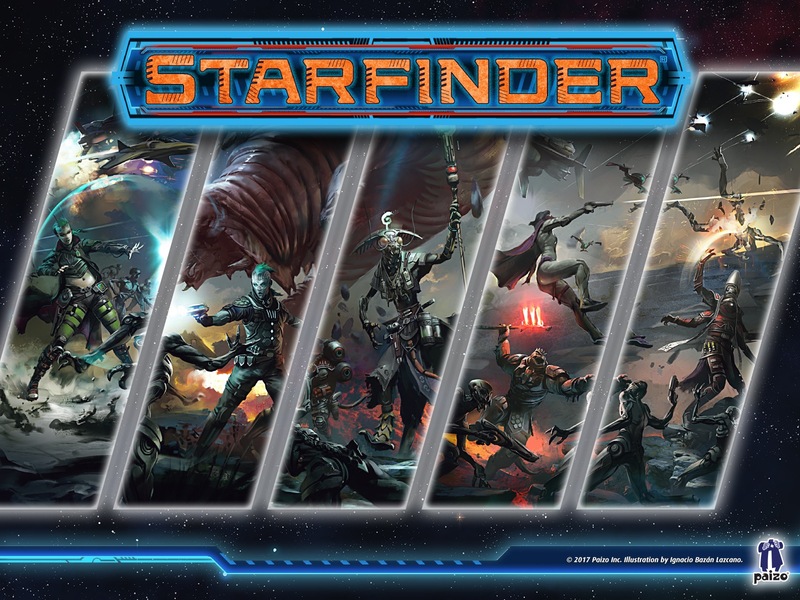 Enjoy the day, some new Starfinder wallpapers to trick out your devices! Free RPG Day is just around the corner this Saturday, June 17th! There a tons of participating locations, so check out the program's event locator, join in the fun, and grab a copy of Paizo's Free RPG Day offerings while supplies last. 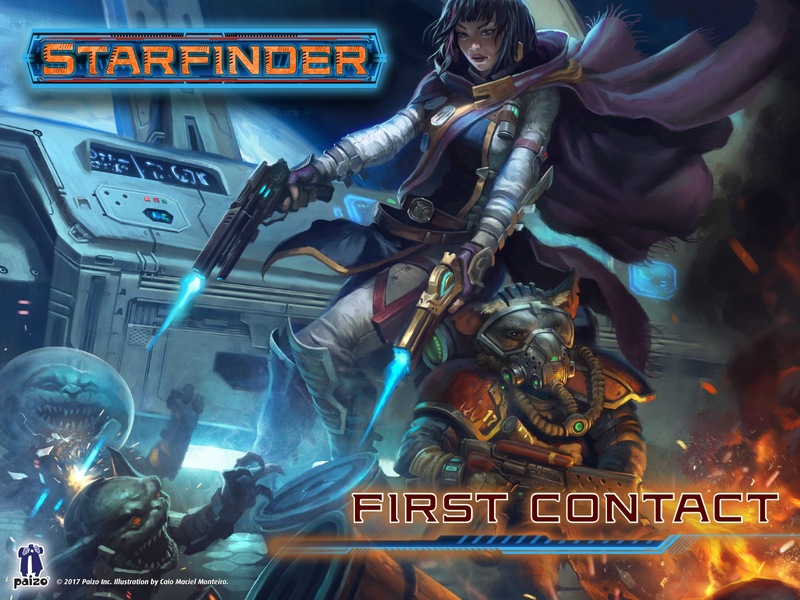 Last month we met the new promo character Reepazo, so today I'd like to present two other prizes: the new Starfinder First Contact and a special Chronicle sheet that you can earn by playing anytime between June 16th and June 25th. 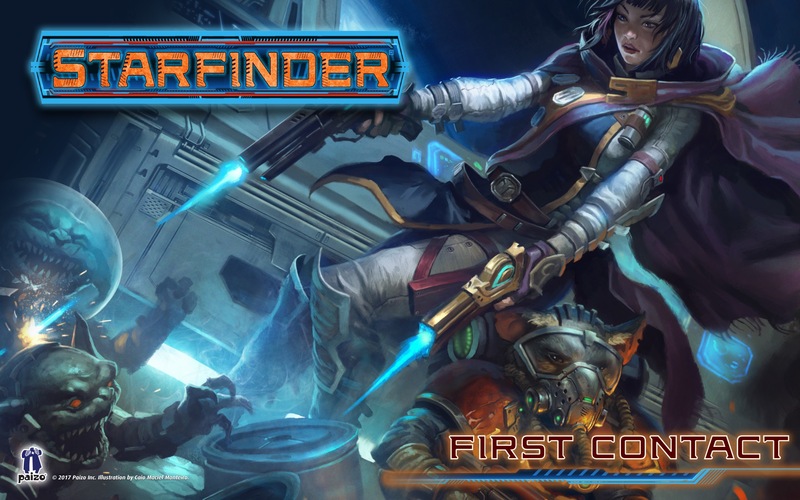 First Contact is an exciting first look at both the Starfinder rules and its setting, presenting 12 different creatures (including 4 different playable races). There's a lot of great content here, and I reached out to the authors to share some of their favorite parts. Illustrations by Johnny Marrow, Kiki Moch Rizky, and Crystal Sully. James L. Sutter: Art-wise, I think my favorite piece is the security robot. I love the sleek futuristic flavor that's part Mac Store, part Prince Robot from Saga, and part classic droid. But a lot of the monsters in here are things I've been waiting to see in print for years—both the ellicoth and the haan started life as brief name-drops in Pathfinder Campaign Setting: Distant Worlds, and now here we are at last. I particularly enjoyed writing about the orocoran ichor lords—it's high time Aucturn got some native inhabitants! 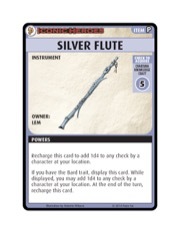 Rob G. McCreary: The bone sages of Eox were first introduced back in Pathfinder Adventure Path #14, and in Pathfinder RPG they were most easily represented by liches. For Starfinder, however, we wanted to update the lich to the science-fantasy future, and thus the necrovite was born. 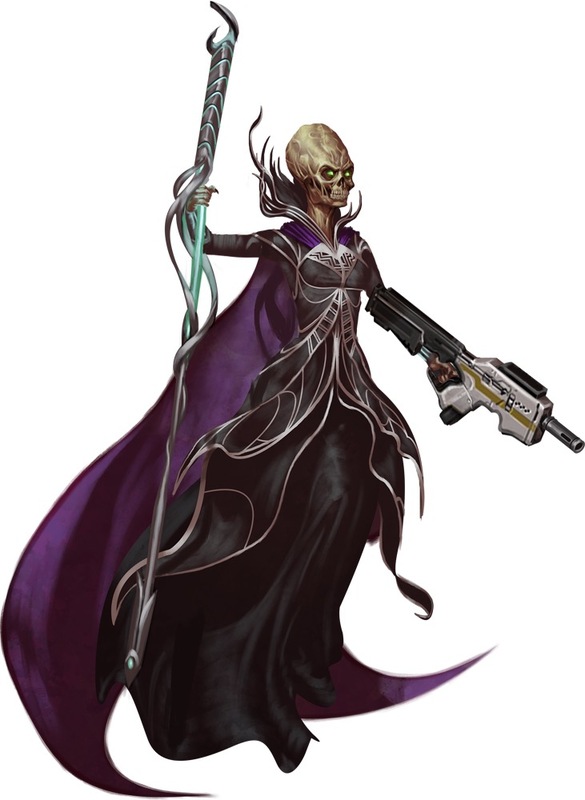 So what makes a necrovite more than just a space-lich (other than a cooler name, of course)? Three things: technomancer AND mystic spells, the Eoxian wrackstaff, and an electroencephalon (because a necrovite has to store her soul somewhere, after all). Jason Keeley: It was a bit of a no-brainer that goblins would be in Starfinder. As a bit of a joke, I wrote them up as "space goblins" for the playtest and gave them cobbled-together laser pistols that tended to blow up in their own faces. It turns out people thought that was funny enough to make them canon with First Contact. And the art, with their bandaged-up bubble helmets, really helped seal the deal! John Compton: Starfinder's been a great chance to flesh out the many weird aliens Paizo—quite often James L. Sutter—has name-dropped, but it's also an exciting opportunity to create entirely new creatures. My assignment for First Contact included "New plant monster (Castrovel)" and the directive to "Make it weird and awesome." I knew I wanted a plant that wasn't a low-mobility ambush predator, and at the time I was fixated on invasive species like kudzu. What resulted was the ksarik, a ferocious carnivore that absorbed psychic energies and evolved from fairly mundane corpse blossoms into aggressive quadrupeds that can absorb others' genetic material in order to take over their ecological niches. I'm a sucker for dorsal crests, and if you look closely, you can see the eyestalks projected to either side like a hammerhead shark. Be sure to look at First Contact for a first taste of what's to come in 2017 and beyond! Even though there's not a new adventure featured for Free RPG Day, we want to encourage you to get out and game together. In fact, we've made a unique Chronicle sheet for the event. If you're playing a game any time from June 16th to June 25th, you can earn a copy of this sheet—just one per participant, no matter how many times you play. In fact, consider printing off some extras to hand out at whatever event you're a part of so that others can join in the benefits. Everyone gets the first boon, which allows the chance to replay (or "re-GM" for credit) one of the past Free RPG Day modules one time, and while it's certainly the spirit of this reward to use that boon for Free RPG Day this year, you're welcome to hold onto it for whenever you need it. If you play in a Free RPG Day game—that's a game hosted by a location participating in Free RPG Day 2017—you also receive the Tome of First Contact boon. Just as you're getting a first glimpse at what Starfinder has to offer, so to has one of your characters found a wondrous bestiary filled with alien beasts and otherworldly people. Reference it to get an edge when facing creatures from beyond Golarion, and above all, enjoy Paizo's contributions to Free RPG Day 2017! Download the Free RPG Day Chronicle sheet! You probably have guessed that we like goblin promo characters. To date, we've issued three of these rotters: Ranzak, Ekkie, and Tup. If goblins could read, they'd tell you to collect the set! Reepazo is a Goblin Bugzapper. No, really. She combines two elements that surprisingly rarely coincide in the Pathfinder universe: she can turn herself into a bug, and she can turn you into a bug. Basically, everybody's a bug. It's Free BUG Day! No, actually, it's Free RPG Day, on Saturday, June 17. Reepazo will be there. Will you? Goblins! Free to a Good Home! Or a Bad Home! Please Take Them Away! Everyone knows that the surest way to improve the quality of any tabletop game is to invite the wholesome goodness* of goblins into your home, and your heart**. For this year's Free RPG Day, Paizo did just that, by delivering the whimsical prequel to our We Be Goblins series of adventures: We B4 Goblins. This lighthearted coming-of-age tale takes your players back in time to adolescence of our iconic goblin heroes***, where they can help these young adventurers reach adulthood by claiming their toads and joining in on their very first raid in a scenario ideal for introducing new players! 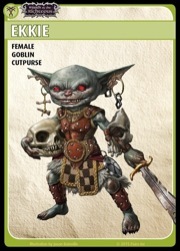 And now, We B4 Goblins is available to YOU free of charge on your paizo.com account! As happens alarmingly often with these adorable*** little tykes, we have more goblins than can reasonably fit in the space provided! So for those of you who plan to run a table with five or six players, we have two brand new goblin characters for your PCs to test drive: the warchanter-in-training Bisbee, and the ever-lovable Smuz, who so obviously a goblin that you shouldn't even consider the possibility that he might not be. Because, I mean, come on. These two little champions are ready to join Reta, Mogmurch, Chuffy, and Poog as they brave the world for the very first time! Visit your friendly local game store today, and print out these handy companions to join your own game today! *For certain, nonbinding values of wholesomeness and goodness. **Paizo Inc. assumes no responsibility for goblins applied to the heart. ***Heroism subject to change. Odds of winning 1 in 1s0,000. ***Adorableness not guaranteed. Consult your owner's manual. Goblins Invade Free RPG Day! Goblins have returned for this momentous occasion—Free RPG Day is here! Free RPG Day is a worldwide gaming event, aimed to bring new and exclusive adventures to local game stores to inspire new comers and long-time gamers alike. 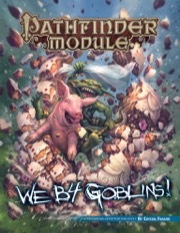 This year Paizo has contributed two new offerings for the event: Pathfinder Module: We B4 Goblins! by Crystal Fraiser and Tup the Terrible for the Pathfinder Adventure Card Game. If you're running We B4 Goblins! 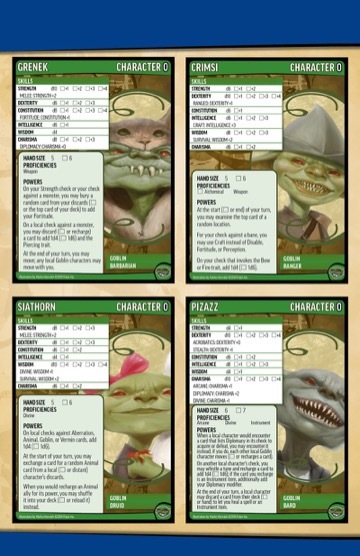 at your local store, or if you've just picked it up and want to try it out, you can download the pregenerated goblin characters for your players right now. This module is also sanctioned for play in the Pathfinder Society Roleplaying Guild. If you're planning on playing at your local game store, there's a Free RPG Day exlusive boon for your Pathfinder Society character—you can learn more about that in last Monday's blog. Ready for a goblin marathon? 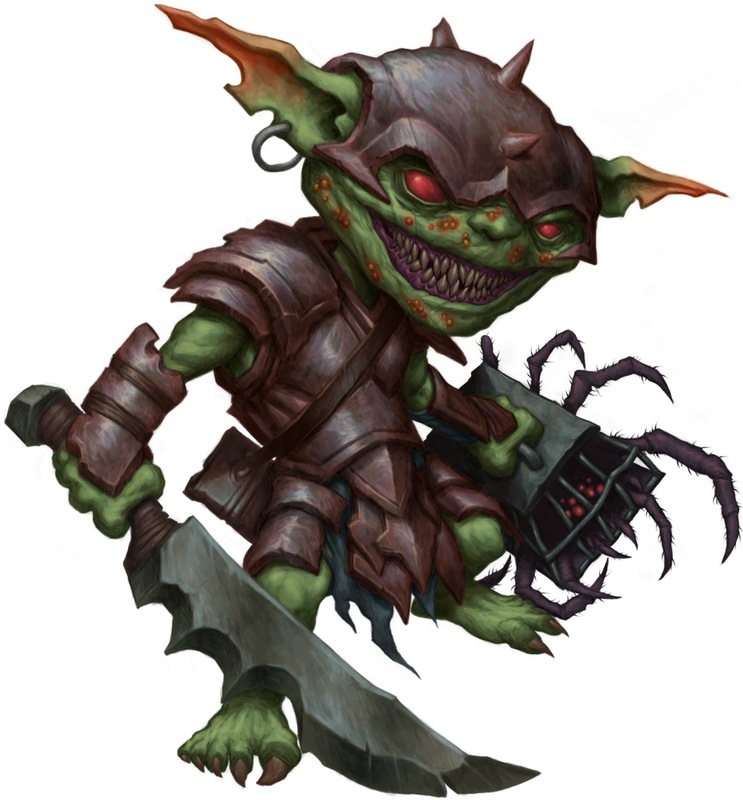 We B4 Goblins is the fourth Pathfinder Module to feature our band of miscreant goblin adventurers: Chuffy Lickwound, Mogmurch, Poog of Zarongel, and Reta Bigbad. You can follow their other harrowing encounters with horses, dogs, and other large monsters in We Be Goblins!, We Be Goblins Too!, and We Be Goblins Free! 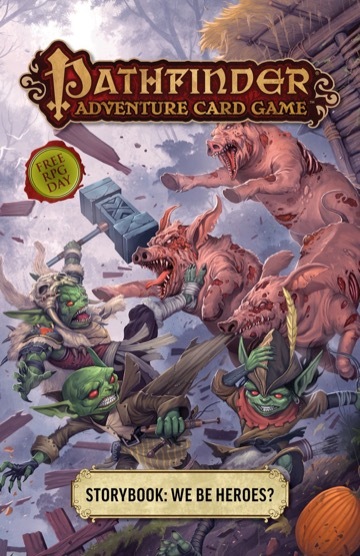 Pathfinder Adventure Card Game Goblin fans can pick up Tup the Terrible at game stores today, too! Tup is a Rise of the Runelords ACG character with just as much of an affinity for fire as his RPG companions. You can add Tup into your game right away, too! We've put together his character sheet below that you can drop into your own game below. 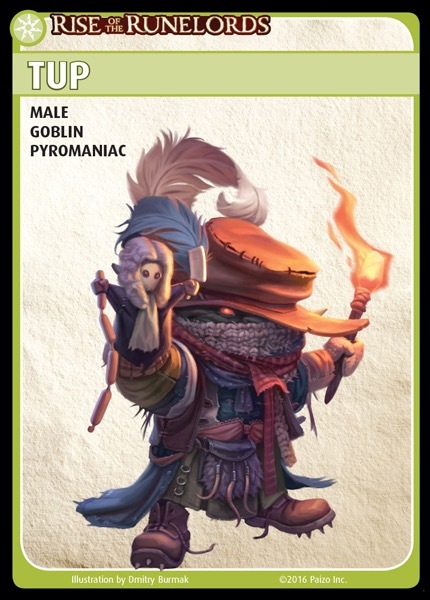 And if you've got a hankering for more goblins in your game, check out Ranzak and Ekkie, or preorder a Goblins Burn! or Goblins Fight! Class Deck (due out this summer). Won't get a chance to head out to Free RPG Day? No worries! Starting on July 1, we'll have We B4 Goblins! available as a free PDF and a $5 print product while supplies last. Tup will not available for purchase until the first day of Gen Con 2016, however, but you'll be able to preorder his promo pack soon! Get out, game, and enjoy Free RPG Day! Given the amount of travel I do as Organized Play Coordinator, you would think I've gotten better at packing. I'm currently surrounded by my suitcase, Class Decks for the Pathfinder Adventure Card Game, and a pile of Paizo shirts, considering how best to get everything into my bag. No matter how many times I do this, I still fret that I haven't remembered everything I needed to pack. But, somehow, it all gets into the bag and I'm off to the airport! I off to Origins tomorrow and am looking forward to seeing more Pathfinders. If you're at the show, please stop by and say hi! Better yet, come see the new Mummy's Mask demo for the Adventure Card Game. This Base Set has a few tricks up its sleeve that are really cool! This blog is another conglomeration of topics. None of them need enough space for their own blog, but each of them involves news that I want to share it with you. So if you want to know more about Free RPG Day, Gen Con events, Faction Pin bonuses, Regional Venture-Coordinators, and campaign flavor, read on. Otherwise, have a great week gaming and I'll see you next Monday! This Saturday, June 18 is Free RPG Day! On the roleplaying side of things, the team got together and sanctioned We B4 Goblins, this year's module written by the fantastic Crystal Frasier, for use in Pathfinder Society organized play. 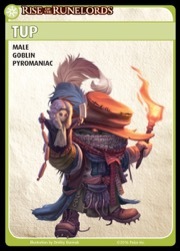 For Adventure Card Game, we see the debut of of Tup the Terrible, goblin pyromancer extraordinaire. Sanctioning documents and pregenerated characters have been added to the product page for We B4 Goblins. This year, in addition to the regular chronicle, we've included a boon for those playing the module in a retail location on Free RPG Day, which grants your character a commerative toad for use in future scenarios. Considering going to Gen Con but haven't gotten your tickets? Already going, but not sure what to participate in? Check out the two newest pregenerated character specials! On Thursday night at 8:00 PM, once again don the guise of Aspis Agents at Gen Con event RPG1697556—PFS Special #7-98: Serpents' Ire (Level 8). Someone skimmed profits from the Aspis Consortium to fund daring experiments & the Aspis have called upon an elite team of agents—both new talent & familiar veterans—to shut it down. Eighth level pregenerated characters are provided for this event. This scenario is part of Season 7's metaplot and follows activities of last year's scenarios #6-97: Siege of Serpents and #6-98: Serpents' Rise. Saturday evening at 8 sees the launch of Season 8 with Gen Con event RPG1697558—PFS Special #7-99: Through Maelstrom Rift (Level 5). Travel the elemental planes as a disturbance on the Plane of Air portends disaster. As a team of elemental guardians, the PCs must brave otherworldly threats to uncover the cause & preserve the balance of the planes. For this event, fifth level pregenerated characters are provided. This scenario launches the Season 8 metaplot. In prior years, we offered Kid's Track events for our younger gamers. They are still on the schedule, but listed as part of the broader Pathfinder Society Academy (PSA) offerings. This year, PSA activities run in the first two slots Thursday through Saturday and the only slot on Sunday. We have Kid's Track Beginner, Advanced, and Transitions lessons as well as family-friendly tables of our evergreen adventures #5-08: The Confirmation, #6-10: The Wounded Wisp, and #7-10: The Consortium Compact. Besides the two special events and PSA, tickets are still available for a variety of PFS scenarios throughout the event. Visit the the Gen Con website and look for events hosted by Paizo. You will also find listed Adventure Card Guild scenarios and seminars on a variety of subjects. Come on out and join us, everyone is welcome! At PaizoCon, we debuted new Pathfinder Society faction pins. We also announced that while the pins wouldn't allow a reroll, like other items, they would grant another in-game benefit to players. The team put its head together and developed a really cool faction flavored program for the pins. Once per session, while wearing a faction pin matching your character's faction, you may add 1 to any skill check. If you apply this benefit to one of your faction's favored skills, listed below, you instead roll 1d4 and add the result. For this roll you also treat the faction's favored skill as if you were trained, even if you don't have a rank in it. Over the past few months, we also said goodbye to two coordinators, as they stepped back from their role. Please take a moment to thank Art Lobdell and Jason Roeder for their service to the team. Both are returning to the ranks of Venture-Captain, Art to New Jersey and Jason to Missouri. I appreciate all they have done for Pathfinder Society as RVCs and am very pleased they are staying on as Venture-Captains and lending their experience to help keep our Society moving forward. This left several vacancies on the RVC team. It is my pleasure to introduce the newest Regional-Coordinators, as well as one who is moving from his position leading the Mid-Atlantic region to the newly created Central Europe region. The past couple weeks have seen heated discussions on our forums between Pathfinders concerning the direction of the Pathfinder Society. Unfortunately, these escalated and hurtful and inappropriate comments were exchanged. If you have strong feelings about what should or should not be included in the campaign, we need you (and all community members) to approach discussions in a calm and measured manner. You may also provide feedback to pathfindersociety@paizo.com. Until next week's blog—safe travels to those heading out and about this convention season. Explore, Report, Cooperate! We know many of you are eagerly awaiting the chance to explore Sandpoint and defeat the Runelords, and we're sorry to keep you waiting just a little bit longer: We're moving the launch day for Pathfinder Adventures to April 26. The good news is why the game is being delayed: during beta testing over the last couple of weeks the community has given us a ton of feedback on everything from visual polish to card balance and general gameplay. We want to evaluate all of the ideas and address as many as possible before launch, and that process is going to take a little bit of time. Ultimately, we hope you all agree that the result will be a better Pathfinder Adventures, just at a sliiiiightly later date. Here's a look at the promo cards in Set #6. As a reminder, these cards have the Owner trait, meaning the character whose name is on the card can treat it as a Basic card. Daji's card could have been named "Red Fox," but then I wouldn't stop shouting "I'm coming to join you, Elizabeth!" People have been saying "Where's Lem?" since Iconic Heroes Set #1. There's this thing where we could only get one small mini into each set, and we wanted to make sure that Biter and... screw it, the important thing is that he's finally here. And he brought his flute! The Instrument trait first appeared on Oloch's Orc War Drum, but has since migrated into Wrath of the Righteous and other decks. Basically, it means that you're gonna add 1d4 to other people's checks in some way—in other words, it'll make you a bit like a Bard. But if you're already a Bard, you get to add that d4 to everything anyone does that turn. Everything. Lem + Flute = popular. Our favorite emo magus gets a shiny bent scimitar. Since he's just as concerned with spells as swords, Seltyiel can use it to pick up spells and then fling them back later. 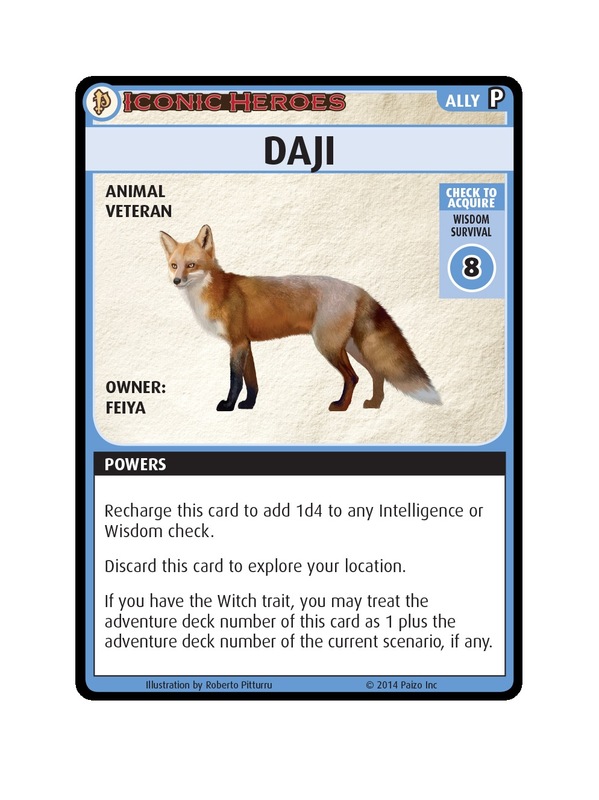 Feiya has two cards in this set, including Daji the fox. Feiya's trick, both in the Skull & Shackles Character Add-On Deck and the upcoming Witch Deck revolves around recharging cards to reduce the difficulty of checks. Daji's great for many a spellcaster due to the Intelligence and Wisdom bumps, but when it's Feiya, suddenly she's reducing difficulty by 6 or 7 all the time. Pretty dodgy, if you ask me. I swear there was some armor around here a minute ago. We haven't released playable versions of Quinn the Investigator, Hayato the Samurai, or Reiko the Ninja yet. But their Iconic Heroes cards are useful even without their owners. 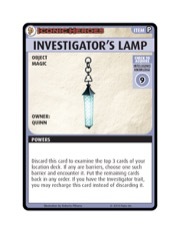 The investigator's main gimmick is peering into dark places. 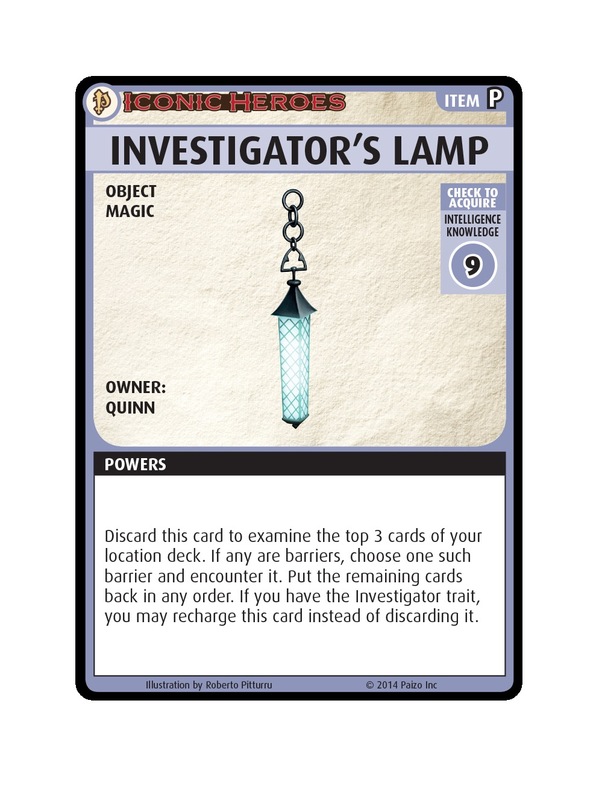 Just as Holmes has his magnifying glass, Quinn has his lamp. Anyone can use it to peek at cards and clear out barriers. When Quinn shows up, he'll be doing that a lot. Reiko's black ninja armor is loaded with hidden weapons. Don't have a need for armor right now? Voop, it's a Hand Crossbow. Or a Dragon Pistol. Or in Reiko's case, maybe it's a Kusarigama. Just the kind of thing your shadowy figures would need in a pinch. So that's Set 6. We get asked a lot, "Will there be more Iconic Heroes sets?" WizKids is still contemplating the answer to that, but we sure hope so. This year's Free RPG Day is June 18, and we've got another goblin character coming your way. We're not gonna say much about him for a little while, but here's Tup the Terrible! Oh, one more thing: He has a sheep named Deliverance. Free RPG Day is here! Today game stores across the world are participating in this event, bringing new and exclusive adventures to their area, and inspiring new comers and long-time gamers to new roleplaying games. This year we're contributing two new products to Free RPG Day. 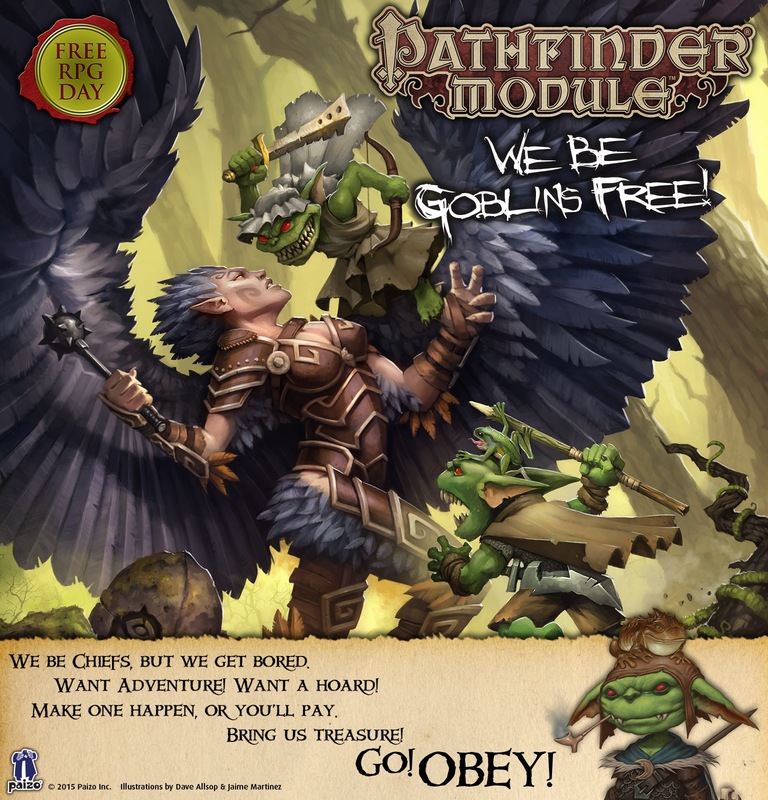 The first is Pathfinder Module: We Be Goblins Free!, a new adventure following the antics of select characters from the Birdcruncher goblin tribe. For Adventure Card Game fans, we've got a real tricksy treat in store: Ekkie the Goblin Cutpurse. Illustrations by Dave Allsop and Jaime Martinez. If you're running We Be Goblins Free! at your local store, or if you've just picked it up and want to try it out, you can download the pregenerated goblin characters for your players right now. This module is also sanctioned for play in the Pathfinder Society Roleplaying Guild. Want to marathon some goblin fun? Why not add We Be Goblins! and We Be Goblins Too! to your gaming arsenal? These adventures all follow the same four goblin adventurers: Chuffy Lickwound, Mogmurch, Poog of Zarongel, and Reta Bigbad. In addition to tables of the new Pathfinder Module, participating stores will also be running demos of the current Pathfinder Adventure Card Game Base Set, Wrath of the Righteous, or the new introductory scenario Demonic Politics. You can also download Ekkie as a free PDF and drop her into your game right now! If you'd like to jump in right away as Ekkie, we've worked up some suggested deck lists below. You'll want to pick the 12-card deck if you're playing the short demo, and the 15-card deck if you're playing a full-length scenario. Either way, should should have the Mythic Champion mythic path card. If you want to start a Wrath of the Righteous campaign and play Ekkie, build her deck by using her Cards List above after the other characters have built their starting decks. Remember that you may only use cards that have the Basic trait. Won't get a chance to head out to Free RPG Day? No worries! Starting on July 1, we'll have We Be Goblins Free! available as a free PDF and a $5 print product while supplies last. While Ekkie will not abvailable for sale until the first day of Gen Con, you can pick up her character mat starting July 1 from paizo.com! 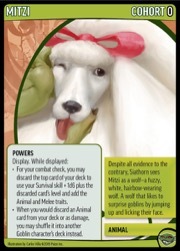 Pathfinder Adventure Card Game subscribers will receive Ekkie in their July shipments. This Saturday, June 20th, is Free RPG Day! Participating hobby game retail locations and industry publishers will be giving away free adventures and other materials so that gamers can try new games and play exclusive content together. This year Paizo has contributed two special products. A few months ago, Tanis O'Conner introduced us to the Pathfinder Adventure Card Game's special treat: the adventurous goblin Ekkie. Of course, many of you familiar with Pathfinder Society have likely met the little warrior while dealing with a certain goblin guild. I have no doubt she'll get up to even crazier antics now that she's a playable character. This Saturday, June 20th, is Free RPG Day! Participating hobby game retail locations and industry publishers will be giving away free adventures and other materials so that gamers can try new games and play exclusive content together. This year Paizo has contributed two special products. A few months ago, Tanis O'Connor introduced us to the Pathfinder Adventure Card Game's special treat: the adventurous goblin Ekkie. Of course, many of you familiar with Pathfinder Society have likely met the little warrior while dealing with a certain goblin guild. I have no doubt she'll get up to even crazier antics now that she's a playable character. We're also debuting We Be Goblins Free!, a new adventure featuring the Licktoad tribe's champions Reta, Mogmurch, Chuffy, and Poog. As in past years, the new Free RPG Day module is also sanctioned for the organized play campaign, and we're releasing the sanctioning document today so that GMs have a chance to read over it and print out Chronicle sheets. If you're planning to play the adventure first, I encourage you not to peek and spoil the surprise, so I'll answer some of your anticipated questions now. How many Prestige Points does We Be Goblins Free grant? This module does have a secondary success condition of sorts, allowing someone to gain up to 2 Prestige Points for playing the adventure. Anyone playing this on Free RPG Day this Saturday automatically qualifies for the second point. Is it bad if my goblin pregenerated character dies? As was the case when I sanctioned We Be Goblins Too, it's still important that a deceased goblin's horribly squishy death be resolved, but doing so happens at a heavily subsidized rate: 5 Prestige Points completely clears up even the worst fate that you might inflict on your pregenerated character during the module. Does the Chronicle sheet have lots of cool boons? The Chronicle sheet has lots of cool boons, including one for Squealy Nord and owlbear enthusiasts. Where can I download the sanctioning document? On the product page or the right-hand side of the Additional Resources page. This year's Free RPG Day is Saturday, June 20, and the card game team has whipped up something special for those of you who like free stuff. Introducing... Ekkie! Ekkie, like her compatriot Ranzak, likes to eat, stab, and steal, not necessarily in that order. She comes with a character card, a token card, and a role card, and she can be played with any Adventure Card Game Base Set. Ekkie will initially be available at stores participating in Free RPG Day on June 20. 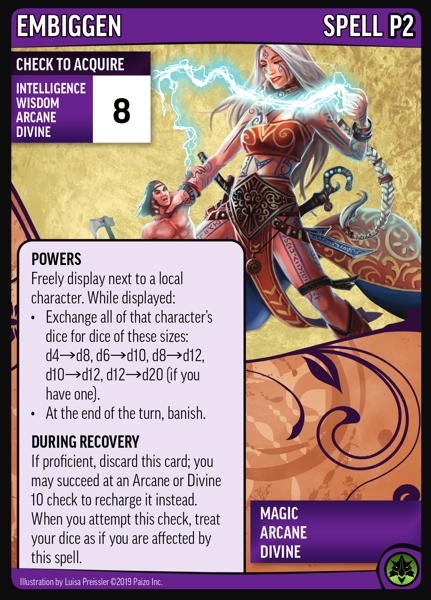 We'll be sending her free to Pathfinder Adventure Card Game subscribers with their July shipment, and she'll also be available for sale at Paizo's Gen Con booth and at paizo.com starting July 30. Hello, Longshanks Hearing Ekkie's Words through Glowing Box! I first meet friendly longshanks in town named Magnimar. Ekkie was just trying to make ends meet, put food in mouth and roof on head, so Ekkie joined fearsome goblin guild named Nightsoil Marauders. Is good, scary name: Nightsoil Marauders! Anyway, Ekkie was sneaking through a longshank house filled with shinies and foods, taking things for the guild and for Ekkie, when the mangiest, barkiest, poodliest of dogmeats sneaks up on me and starts barking. "Bark!" it says. "Bark bark bark! 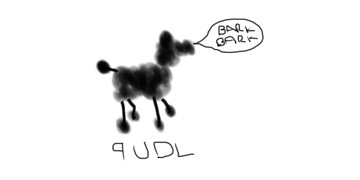 Bark bark bark!" Always alerting the sleeping longshanks. Poodles are the WORST. And poodles don't even taste good, mostly because the curly hairs get stuck between goblin teeth. Stupid poodle will not shut up, so longshanks come and chase me up and down and all around the town. That part is fun, but eventually they catch up to me and want all this talking and doing and not stealing and not eating. Nightsoil Marauders are—what is longshanks words again?—"unfortunate casualties," so Ekkie is alone again. But longshanks? Longshanks are "noble adventurers," which means sneaking and stabbing and eating, but with getting paid afterward. Seems like a good gig to Ekkie. So now, Ekkie is an adventurer! Today is the day! Across the world, game stores are currently participating in Free RPG Day, and Paizo has two exciting products that are being released just for this event. This year we are releasing Pathfinder Module: Risen from the Sands and Ranzak the Goblin Raider for the Pathfinder Adventure Card Game as we get ready to release the Skull & Shackles Base Set. You can learn more about these products in our blog from this past Thursday. If you've already picked up Ranzak from your local game store, we have put together downloadable character sheets so you can drop him into your game right now! Today is the day! Across the world, game stores are currently participating in Free RPG Day, and Paizo has two exciting products that are being released just for this event. This year we are releasing Pathfinder Module: Risen from the Sands and Ranzak the Goblin Raider for the Pathfinder Adventure Card Game as we get ready to release the Skull & Shackles Base Set. You can learn more about these products and download the Pregen Characters for the module in our blog from this past Thursday. If you've already picked up Ranzak from your local game store, we have put together downloadable character sheets so you can drop him into your game right now! And if you haven't made it to Free RPG Day, don't worry! On July 1, Risen from the Sands will become available as a free PDF and a $5 print product while supplies last, exclusively at paizo.com—and at PaizoCon and Gen Con! Ranzak will also be for sale at PaizoCon and Gen Con, and on paizo.com (while supplies last) after Gen Con begins. 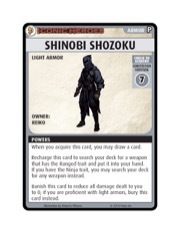 Pathfinder ACG subscribers will also get Ranzak free with their August shipment, along with a few other promo cards. We hope you're enjoying Free RPG Day, and look forward to sharing more about the Skull & Shackles Base Set as we get closer to release this year at Gen Con! Join Paizo for Free RPG Day this Saturday! One of the best days in gaming hits this weekend: Free RPG Day! This Saturday—June 21st—all across the world, participating game stores will literally be giving away incredible RPG rules, adventures, and accessories, and you're not going to want to miss it! As for us, this year Paizo's got not just one, but two fantastic Pathfinder Free RPG day offerings! 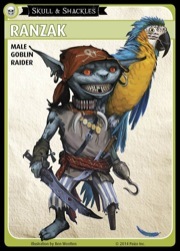 Ranzak the Pirate Goblin: For Adventure Card Game players already looking forward to August's release of the Pathfinder Adventure Card Game: Skull & Shackles Base Set we've got the perfect preview: Ranzak the Pirate Goblin! This brand-new character card combines that infamous goblin lunacy with a piratical love of plunder, assuring an entirely madcap character experience like none you've ever had in the Pathfinder Adventure Card Game. You can use Ranzak right away to give a bizarre twist to your Rise of the Runelords game or save him for your upcoming Skull & Shackles adventures! 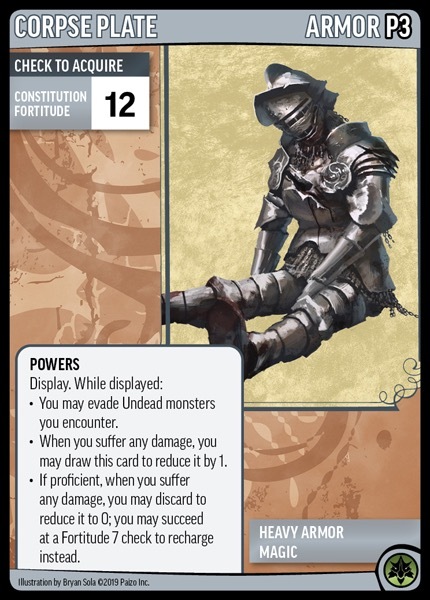 Ranzak will only be available in limited supplies after Pathfinder Adventure Card Game: Skull & Shackles Base Set releases in August, so be sure to nab your copy this weekend! Pathfinder Module: Risen from the Sands: A forgotten pharaoh rises in this year's Free RPG Day adventure, a perfect one-shot quest to play at your favorite game store or add to your home campaign. Aside from featuring a complete delve through an ancient, unexplored pyramid, Risen from the Sands includes a playable preview of four of the new classes in the upcoming Pathfinder Roleplaying Game Advanced Class Guide ! Play Risen from the Sands as one of four pregenerated characters—the daring swashbuckler, cunning investigator, brutal warpriest, or unstoppable bloodrager—weeks before those classes' debut in game stores this August. Also, to help run your Risen from the Sands adventure, check out the two Bestiary 4 monster templates below. GMs will find both handy in running this new adventure if they don't have their copy of Bestiary 4 on hand. "Mummified creature" is an acquired template that can be added to any living corporeal creature (hereafter referred to as the base creature). A mummified creature uses all of the base creature's statistics except as noted here. Type: The creature's type changes to undead (augmented). It retains any other subtypes as well, except for alignment subtypes and subtypes that indicate kind. Do not recalculate class HD, BAB, saves, or skill points. Senses: A mummified creature gains darkvision 60 feet. Aura: A mummified creature gains a frightful presence aura with a range of 30 feet and a duration of 1d6 rounds. Hit Dice: Change all racial Hit Dice to d8s. Class Hit Dice are unaffected. As an undead, a mummified creature uses its Charisma modifier to determine bonus hit points (instead of Constitution). Defensive Abilities: A mummified creature gains DR 5/— and the defensive abilities granted by the undead type. Weaknesses: The mummification process leaves a mummified creature vulnerable to a single energy type. Choose or determine randomly from the following list. d10 Energy 1 Electricity 2–3 Acid 4–7 Fire 8–9 Cold 10 Sonic As a fail-safe in case of rebellion, a mummified creature is subtly marked during the ritual process with a hieroglyph someplace inconspicuous on its body or wrappings that identifies the particular energy type to which it is vulnerable. A successful DC 20 Perception check is needed to find the mark, but a successful DC 25 Linguistics check is still required to decipher the hieroglyph's meaning. Speed: Decrease all speeds by 10 feet (to a minimum of 5 feet). If the base creature has a f light speed, its maneuverability changes to clumsy. Attacks: The mummification process hardens the mummified creature's bones to a stone-like density, granting the mummified creature a powerful slam attack if the base creature has no other natural attacks. This slam attack deals damage based on the mummified creature's size (Bestiary 302), treating the creature as if it were one size category larger. Special Attacks: A mummified creature gains the following special attacks. Burst of Vengeance (Su): Despite its slow, lumbering nature, a mummified creature is capable of lurching forward to attack with a short but surprising explosion of speed. Twice per day as a swift action, a mummified creature may act as if affected by a haste spell for 1 round. Dust Stroke (Su): A creature killed by a mummified creature's natural attack or slam attack is disintegrated into a cloud of dust and ash, completely destroying the victim's body (as disintegrate). Abilities: Str +4, Int –2 (minimum 1). As an undead creature, a mummified creature has no Constitution score. Feats: A mummified creature gains Toughness as a bonus feat, and Improved Natural Attack as a bonus feat for each of the base creature's natural attacks. Skills: A mummified creature gains a +4 racial bonus on Stealth checks. "Zombie lord" is an acquired template that can be added to any corporeal creature (other than undead) that has a minimum Intelligence of 3. This corporeal creature is referred to hereafter as the base creature. CR: A zombie lord's CR is 1 higher than that of a normal zombie with the same Hit Dice, plus the normal CR increase for class levels (if any). Type: The creature's type becomes undead. It keeps subtypes except for alignment subtypes and subtypes that indicate kind. Armor Class: Natural armor as per zombie (Pathfinder RPG Bestiary 288). Hit Dice: Change all of the creature's racial Hit Dice to d8s, then add 2 racial Hit Dice to this total (creatures without racial HD gain 2 undead HD). Hit Dice from class levels are unchanged. Saving Throws: Base save bonuses for racial Hit Dice are Fort +1/3 HD, Ref +1/3 HD, and Will +1/2 HD + 2. Defensive Abilities: A zombie lord gains DR 5/slashing and channel resistance +4, in addition to undead traits. Speed: As zombie (Bestiary 288). Attacks: As zombie (Bestiary 289). Abilities: Str +2, Dex +2. As an undead, it has no Constitution score. BAB: A zombie lord's BAB for its racial HD is equal to 3/4 its HD. Skills: A zombie lord gains skill ranks per racial Hit Die equal to 4 + its Int modifier (class skills as the undead type). Skills gained from class levels remain unchanged. Feats: A zombie lord gains Toughness as a bonus feat. Special Qualities: Unlike a common zombie, a zombie lord does not gain the staggered special quality. So check with your local game store to make sure they're participating in Free RPG Day and get out there to get your copies of Ranzak and Pathfinder Module: Risen from the Sands. For more details on Free RPG Day be sure to check out http://www.freerpgday.com . We'll see you all at the game store! Update Character sheets for four brand new Advanced Class Guide iconic characters are now available for download here (1.3 MB zip/PDF). Print them out for your own run through Risen from the Sands or for your home campaign! Mysteries of the Past and Future! A band of bold adventurers are the first to arrive, and stand poised to claim what's risen from the sands—but they're unaware of the doom that lurks inside. With daring on their side and strange, rarely seen powers at their disposal, the heroes may be the only force capable of containing the force of evil within and defeating its curse! But we're not just reaching into the forgotten past for this year's offering, we're also looking toward the future. Toward August, in particular, as Risen from the Sands includes four ready-to-play, pregenerated characters previewing four classes from this Summer's major hardcover release, Pathfinder RPG: Advanced Class Guide. Free RPG Day is Saturday June 21st, so be sure to check with your local gaming store to make sure they'll be participating. It's less than 3 months away, so mark your calendar and don't miss out on Risen from the Sands, a new Pathfinder Adventure Card Game hero, and plenty more Free RPG Day awesomeness! *No, they can't be goblin adventures every year, or else you won't appreciate them. 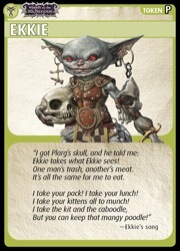 This year the Pathfinder Adventure Card Game has your annual dash of goblin goodness. Summer's coming, and that means Free RPG Day is just around the corner! As you no doubt know, June 15th is a day set aside for your friendly local game retailer to give you free goodies to get you excited about playing RPGs. 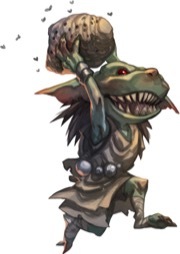 This year, Paizo is contributing We Be Goblins Too! This follow-up adventure to the popular 2011 Free RPG Day module, We Be Goblins! puts you and your friends back in the goblin POV as you try to find a place for yourselves in an unfamiliar tribe. Don't miss out on We Be Goblins Too! Stop by your local game store on Free RPG Day and pick up a physical copy. If you can't make it to Free RPG Day, you can get these 16 pages of goblin mayhem from the Paizo store starting in July. 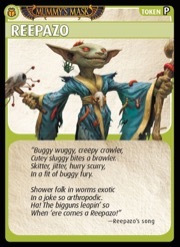 Pathfinder Battles Preview: At Last, the Goblin Mystic! Way back when we first announced Heroes & Monsters, the very first Pathfinder Battles prepainted fantasy miniatures set, we knew we needed to include Pathfinder goblins from the very start. It’s an open secret that about half of that set was already in development at WizKids when we got involved, and a lot of the specifically Pathfinder creatures came relatively late in the process. Some of the figures, such as the Human Rogue and Orc Brute bear an uncanny resemblance to classic Mage Knight figures from the first era of prepainted plastic miniatures, whereas others like Seelah and the Ogre were more or less direct ports of Pathfinder art to miniature form. 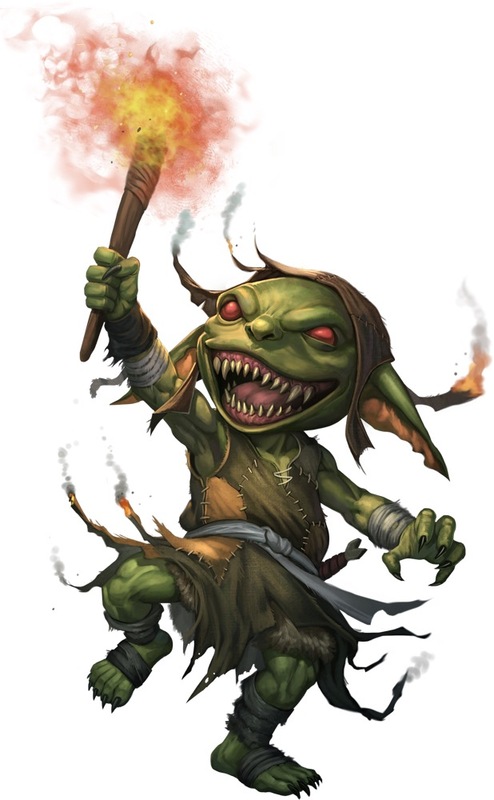 The Goblin Warrior and Goblin Hero figures are examples of miniatures directly inspired by Pathfinder art, but what only some of the most astute Pathfinder Battles observers remember is that Heroes & Monsters was originally to include a third goblin, the mysterious Goblin Mystic. Here’s the weird tale about how that miniature failed to happen the first time, and how we finally got a chance to bring him out with the upcoming We Be Goblins Builder Series set due in stores in late May. 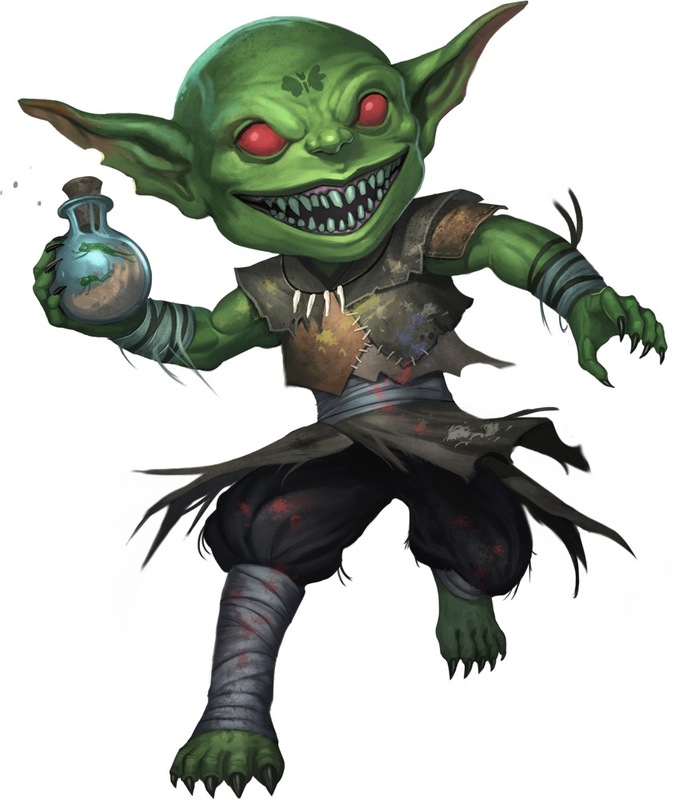 The original Goblin Mystic was a port from an existing WizKids sculpt, modified slightly so that it better matched the Pathfinder goblin art. The original sculpt featured a goblin sitting cross-legged on a floating flying carpet. This was problematic because flying carpets in Pathfinder are not appropriate treasure for most goblins. Worse, the original sculpt was much, much taller than a Pathfinder goblin, so the Goblin Mystic was as tall sitting down as our regular goblins were standing up, which wasn’t something we could fix without scrapping the entire sculpt. We decided to try to make it work anyway, and when we sent WizKids reference art for the only real “goblin mystic” that we had—the antagonist goblin druid Vorka from the original We Be Goblins! adventure, I’m afraid things went from bad to worse. The original sculpt was still way too big, only this time she was wearing a big dumb Gandalf hat on top of all the other problems. Ultimately, we decided we couldn’t make things work in time, and that the poor old Goblin Mystic would need to wait for a future set. 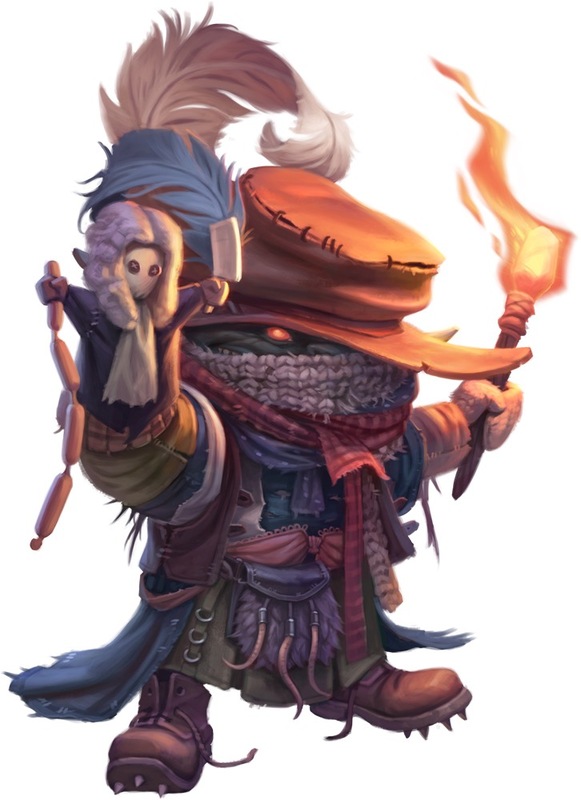 I’m pleased to report that the We Be Goblins Builder Series set offers us the perfect opportunity to reintroduce a “goblin mystic” to the Pathfinder Battles line, only this time without the troublesome flying carpet and at the correct scale. And we decided to cut through the earlier problems by actually making the goblin mystic Vorka herself, rather than a freakishly tall monster simply wearing Vorka’s hat. So here she is in all her glory, the goblin villain Vorka! In addition to new friends like Vorka and her goblin player character adversaries from both the original We Be Goblins! adventure and Free RPG Day 2013’s We Be Goblins Too!, the new We Be Goblins Builder Series set includes repaints of classic Pathfinder Battles sculpts like this major bad boy, the Goblin Warchief! This upper-tier goblin villain comes with his very own riding lizard and a massive hate-on for the player characters. He’s based on the Warchief Ripnugget figure from Rise of the Runelords, with a unique new paint scheme. There are two more We Be Goblins figures left to preview, but a mix-up here at the office sent them to the factory before we had a chance to take good pictures of them. Instead, next week we’ll have to content ourselves with preview images of jaw-droppers from the very next full set, which we’ll announce here on paizo.com early next week! A double dose of Pathfinder Battles news? AMAZING! You guys are going to explode when you see the figures from the next set. Set your internal spontaneous combustion engines to next week. You are all about to go BOOM! We've already previewed four figures from the set on previous Fridays, which leaves four more for upcoming weeks. But I've got to churn through them FAST, because we are at the very doorstep of the announcement of the very next full set. WizKids brought the first round of paint masters for THAT by the office this week, and they are better than anything we've seen from them before. But that's getting ahead of myself. Onward my goblin soldiers! I'm back in the office after a week and a half in the blissful tropical paradise of Hawaii (with a busted computer, no less), and that means work must commence. The Spice must flow. 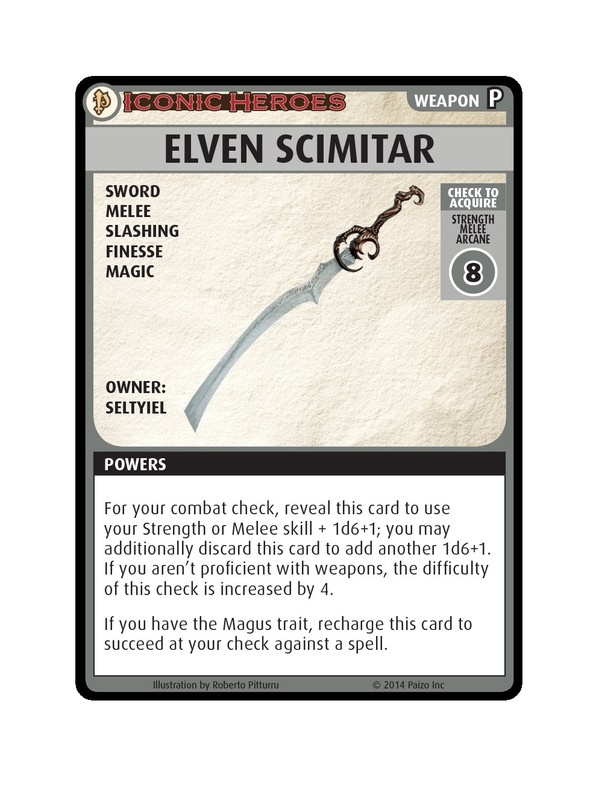 And Pathfinder Battles Previews must continue! And because I missed last week's update, this week is a double dose of goblin greatness, brought to you by yours truly and the fine folks over at WizKids, who continue to set new standards with sculpts and painting on our prepainted Pathfinder Battles figures. This week we've got four more figures from the We Be Goblins! Builder Series set. Each figure is packed in a randomly assorted single-figure blind box for the low price of $2.49, making it easier than ever to assemble your very own goblin horde! Up first is the Goblin Warrior, a repainted version of our very first goblin figure from the original Heroes & Monsters set. This figure is almost sold out on the secondary market, and has been commanding some pretty crazy prices, which is one reason we wanted to bring him out again and give gamers another shot at him. You can never have too many mooks, after all. Here we have the repainted Goblin Commando, originally from the Rise of the Runelords set. With his mighty horsechopper in hand, this little guy is ready to terrorize your campaigns! Speaking of terrifying, is there anything scarier than a goblin in a wedding dress wearing a wig of beautiful blonde hair? 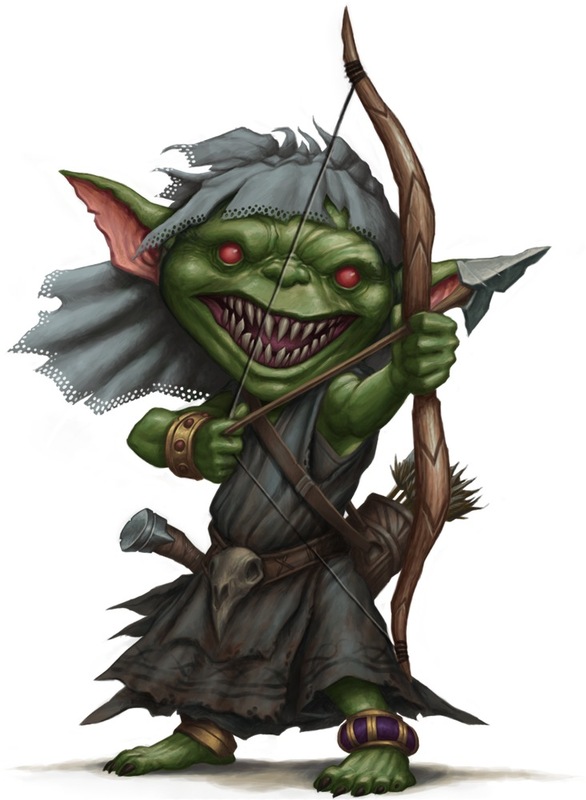 How about the same goblin, with a bow and arrow? We added this feature to the figure because the original illustration didn't have a weapon, and we thought she was scarier this way. And also awesomer (did you know publishers get to use fake words without consequence?). And here we have the titular bomb from the name of this week's blog. Why, it's Mogmurch the goblin alchemist, complete with a cool skull helmet and an even cooler olde tyme bomb ready to go off in his hand. Or at the feet of your player characters! 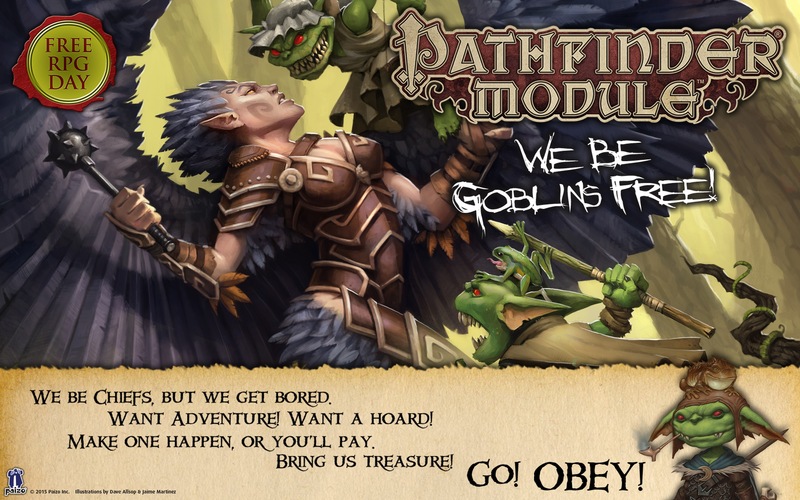 Mogmurch and Reta are playable characters in We Be Goblins Too!, this year's Paizo offering for Free RPG Day! That promotion takes place at game stores all around the world on June 15th. The We Be Goblins Builder Series set is scheduled for a May 29 release. 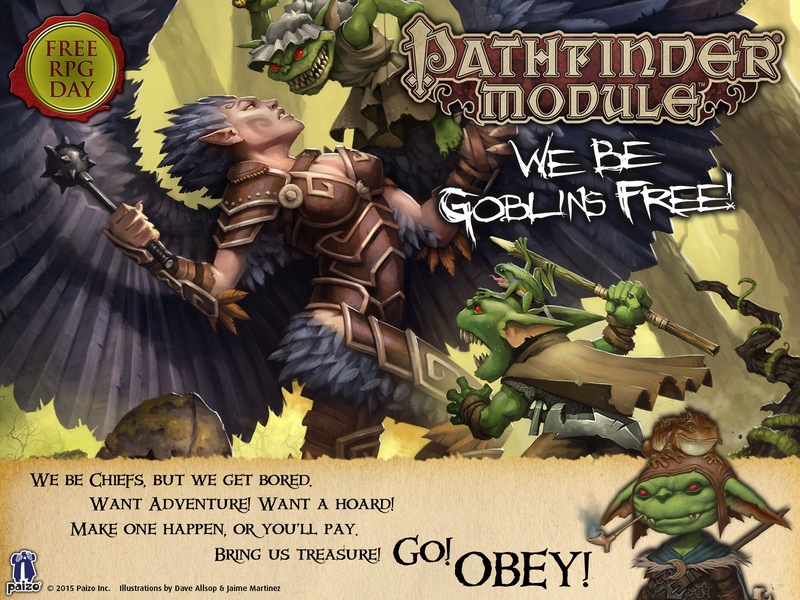 Pathfinder Battles Preview: Goblins on the March! May sees the release of the new Pathfinder Battles Builder Series We Be Goblins set, a collection of 12 goblin minis sold in a blind-packed, single-figure packages. The release is timed to coincide with Free RPG Day (June 15th), and our cool new free adventure, We Be Goblins Too! Here I am on Day 3 of my vacation in Maui, and naturally my computer has helpfully broken on me. I think that poor thing needed a vacation more than I did, and it's part of a psy-ops move to convince me NOT TO WORK on my vacation. Silly computer, it's 2013, man. I can blog from my iPhone! So let's talk about goblins, even if briefly (to protect my vacationing thumbs). That adventure (which you can get free at participating game retailers) features the same four goblin player characters we introduced in the original We Be Goblins adventure, and all four are included as brand new sculpts in this new Pathfinder Battles set. Goblin player characters such as this fine gentleman, Mister Chuffy Lickwound! In addition to five new sculpts like Chuffy, the We Be Goblins Builder Series set also includes exclusive repainted goblins from previous Pathfinder Battles sets, such as this Goblin Hero, originally from the first set, Heroes & Monsters. Goblins from early sets like the Goblin Hero have been very popular on the secondary market, and they're starting to get pretty expensive. With a single-figure We Be Goblins pack selling for $2.49, figures like the Goblin Hero offer an affordable way to build up your goblin hordes! And that's it for me. Back to the salt mines of tropical forests and black sand beaches. I'll find a way to preview two more figures next week, ideally with a computer fully recharged and healed with the spirit of aloha! Free RPG Day is this Saturday! Be sure to swing on by your friendly local game store to get your copy of Pathfinder Module: Dawn of the Scarlet Sun, written by our very own James Jacobs, along with tons of other free offerings from the greatest in gaming. Our offering this year, Dawn of the Scarlet Sun, is built to tie in perfectly with the Pathfinder Battles: Champions of Evil Encounter Pack, which, along with the pregenerated characters included in the module, give you everything you need for a day of adventure at your favorite gaming den. So be sure to check out the Free RPG Day website for a complete list of retailers participating in this weekend’s excitement. See you at the game store! Free Stuff on Our Website! Check out our Community Use Package! So some of you may or may not know that we updated some parts of our Community Use Package the other day. Some of you may or may not know what that even means, which is a darn shame, since we put out some really cool, really free stuff that people don't even know about. In addition to the Player's Guides for each new Adventure Path we put out every six months, below is a list of some neato things that we put on our site that you can use for free under our Community Use Policy. At Gen Con, I realized that a lot of people didn't know that you don't even need to buy most of our products to enjoy them, and that we put up all our rules on our own website for free. It's kind of this insane marketing scheme we have, where we like our customers so much that we give you all the rules you need to play our game for free, and it totally works. It's called the Pathfinder Roleplaying Game Reference Document, and it's a giant archive of all our rules, so that you can play the game without even opening your book up. It's searchable, official, totally free, and updated often. The Community Use Package consist of files we provide freely on our website, including big ol' maps of our world, symbols to put on your own maps, character sheets, and other cool icons and logos to use as you may. We're pretty down with our fans using things we make to express their appreciation for our products, and you can use a lot of our campaign setting stuff for your own needs as long as you comply with our Community Use Policy. Pathfinder Society Organized Play is getting pretty popular. We just kicked off Season 3 of Pathfinder Society a couple months ago, and to commemorate the event we released three free full-length scenarios to introduce new and veteran players alike to the exciting world of our organized play campaign! Scroll down to the bottom of the linked page here and check them out! In addition, you can get yourself a free copy of the Guide to Pathfinder Society Organized Play on our website as well. If you don't know about Free RPG Day already, you've been missing out. But that's okay! Because you can still download the products we release on these esteemed occasions on our website. Our last Free PRG Day product was the module We Be Goblins, which is an absolute blast, and in the past we've put out the much-acclaimed Master of the Fallen Fortress module and the Pathfinder RPG Bonus Bestiary, which includes plenty of baddies to throw at your players. We Be Goblins—You Get Free Stuff! Tomorrow, retail stores around the globe will open their doors and hand out free RPG materials from some of the game industry's most well-known companies. Why? Well tomorrow is Free RPG Day and once again Paizo is taking part in this great program and has produced We Be Goblins, a most unusual (and fully sanctioned for use in the Pathfinder Society) adventure for 1st-level goblin characters. Check out the Free RPG Day website for more information and a link to participating retailers. Here in the Seattle area, Pathfinder Lead Designer Jason Bulmahn will be running a few sessions of We Be Goblins, at his local store—Card Kingdoms out in Ballard. Stop on by, say hi, and then roll some dice! A couple of weeks ago we interviewed Ed Greenwood, our Guest of Honor at PaizoCon 2011. This time I had the pleasure of interviewing Tyler Walpole, our Artist Guest of Honor this year. Tyler is one of those artists who just gets it. I don't think he's created a piece I don't love and it's going to be awesome to see him at PaizoCon this year. From orcs battling giant monsters single-handedly, to lone barbarians taking on giant arachnid robots, Tyler's art is dynamic, detailed, and just plain awesome. Tyler's definitely on the list of artists I want to paint murals in every room of my future mansion when I win the lottery. And he's an illustrating machine, doing work for us (seriously, look how awesome the Master of the Fallen Fortress cover is), IDW on the D&D comic, Hero Games, and a ton of other high-profile companies. We're lucky to have him with us at PaizoCon, and if you're coming out, you should definitely see if you can buy him enough drinks to get a sketch. 1. A brief bio, where you are from and how you started in the industry? I am a self-taught illustrator who lives in Des Moines, Iowa. I spent several years trying to break into the comic book industry as a penciler. That ended up being a bit like pounding my head against a brick wall. Lots of offers to do work for free, but no professional (i.e., paid) work. In 2000 I decided to forgo my annual trip to Wizard World Chicago, and instead created a portfolio of black-and-white interior illustrations and went to Gen Con. I talked to every art director I could find on the showroom floor. When I got home, I had an offer to do some work for Palladium Books, and that worked out pretty well, so I kept pursuing more and more game work (and added color into the mix) until I had enough coming in to make the jump to full time. I've managed to stay pretty busy ever since. 2. When did you discover your creative talents? I've been drawing since I could hold a pencil. I spent a lot of time in grade school being told not to draw on my homework... now drawing is my homework! I take inspiration from everything. Movies, games, books, walks in the park, all of it! I have a pretty active mind, and almost anything can germinate in there and come out as something useful for my art. 5. Do you have a favorite story or character? Let see... I'm pretty satisfied with most of the covers I've done, my favorite is probably the Orcs of Golarion. It's essentially a Conan vs. the Monster illustration... only in this case Conan is an Orc, and he's dual-wielding axes. Sarah pretty much let me do my own thing on that one, in design terms, and I really enjoyed it. 6. Who are your favorite artists, writers, and/or influences? Well, here again, it could be just about anybody. Some of my favorites include Donato Giancola, Dan Dos Santos, Todd Lockwood, Greg Manchess, Frank Frazetta, James Jean, Phil Hale, Mike Mignola, Kevin Nowlan, Adam Hughes, Bill Willingham, and Jim Butcher. 7. How do you juggle freelance work and life? I skip out on a lot of sleep. No, seriously, I skip out on a lot of sleep. I love my job, but I'm married and have two sons. I do my best to make it to every family function, school event, and baseball game. But, many nights, once everyone is in bed, I sneak back to the studio to make sure I'm on top of my deadlines, and squeeze in some time to develop my own projects. Living the dream. So grateful! 9. What's the best thing to happen to you recently? Besides being Artist Guest of Honor at PaizoCon 2011, you mean? I found a publisher for one of those projects! 10. Any advice for aspiring artists? Practice your art. All. The. Time. Whatever you decide to do, whatever voice emerges through your art, or writing or music, honor it, and do it the best you can... the business part of it will follow. People are drawn to excellence in many forms, so don't try to be like the other guy. And keep at it! For more information on Squealy Nord and your chance to join the Licktoad heroes on their epic quest, be sure to stop by your local game store on June 18th to pick up your free copy of our Free RPG Day adventure, We Be Goblins! One of the hardest things about working at Paizo is not talking about the awesome products that are being worked on but haven't been announced yet. Especially when you're the marketing guy and it's your job to tell people about the awesome products that we're working on. This year's Free RPG Day release, We Be Goblins! is a perfect example of this; it's been in the works for months but I haven't been able to say anything until now. We Be Goblins! is a complementary adventure to August's Pathfinder Player Companion: Goblins of Golarion (which I also just announced right there—sneaky, eh?) and an optional prequel to Pathfinder Adventure Path's upcoming Jade Regent Adventure Path. This special 16-page Pathfinder Module will initially be made available as Paizo's contribution to Free RPG Day on Saturday, June 18. Print editions will be available for sale exclusively on paizo.com beginning the following Monday, and a FREE PDF will also be released that day. Have you ever wondered just what is inside those siege castles outside Absalom? Have you ever smelled the heady stench of troglodytes in the morning? Have you always wanted to join the Pathfinder Society, but could never figure out just how to impress them? Or do you want to know just a little more about the Advanced Player's Guide? Well, you're in luck! Free RPG Day is almost upon us! On Saturday, many of you can go to your Friendly Local Game Store and pick up all sorts of free RPG products, including Paizo's own offering, Master of the Fallen Fortress, by yours truly. Check the official Free RPG Day Retailer Locator to see if stores in your area are participating. So what's all the hoopla about? Master of the Fallen Fortress takes a group of 1st-level PCs into one of the ruined siege castles that litter the Cairnlands outside Absalom. While it's a standalone Pathfinder Module, the adventure can also be used as an introduction to Pathfinder Society Organized Play, Paizo's constantly evolving, worldwide mega-campaign. And even better, it gives a preview of the six new iconic characters from the upcoming Advanced Player's Guide, statted up as pregenerated characters to get you right into the action! Adventure is coming your way this weekend, just around the corner and down the road. Defeat the Master of the Fallen Fortress, rescue a captive Pathfinder, and on the way, say hi to Alahazra, Alain, Balazar, Damiel, Feiya, and Imrijka for me! The Free RPG Day is almost upon us, as is your chance to grab your copy of the limited Pathfinder RPG Bonus Bestiary for free! This Saturday, June 20th, participating retailers will be handing out this fabulous little full-color supplement featuring 13 classic monsters, each updated to the upcoming Pathfinder RPG rules! 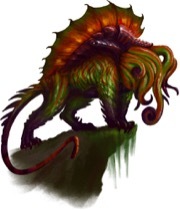 These critters won't be found in the Pathfinder RPG Bestiary, so if you want an early copy for your Pathfinder game, find a local participating retailer at www.freerpgday.com! Even though Free RPG Day is still 70-some days away, we just got in our first look at this year's offering, the Pathfinder Roleplaying Game: Bonus Bestiary, here in the Paizo offices, and for a freebie, just let me say wow!. Way more than just a preview of the upcoming Pathfinder RPG Bestiary, this 16-page mini-manual of monstrosities shows off new rules for monsters straight from the Pathfinder RPG, a rundown of just 257 of the monsters you can expect to appear in September's Bestiary, and updated statistics for 13 classic monsters—including the allip, carytid column, faerie dragon, and shadow mastiff—not to mention a few other surprises slipped in there. Also, although it's been hiding on the product page for a while, here's Tyler Walpole's action-packed cover, which kind of gives away one more monster hiding in the book. You can pick up your totally free copy of the Bonus Bestiary in print at local game stores as part of Free RPG Day on Saturday, June 20th. Free PDFs of the book will also be available right here at paizo.com on Free RPG Day and thereafter (with a limited number of print copies also being available for cheap soon after). Good stuff, and I can't wait to show off more from it—like a ton of awesome new monster art—in the coming month. 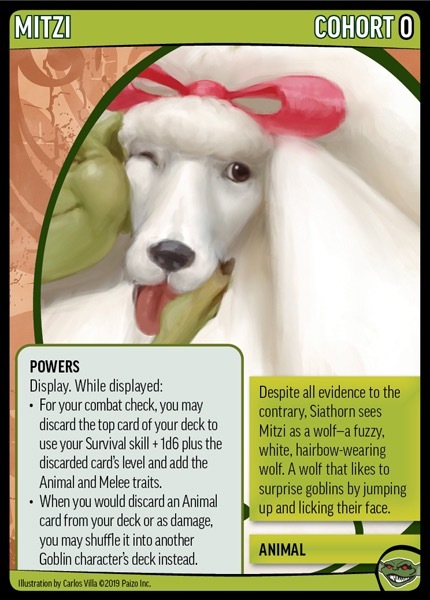 Oh, and for cthulhudarren from the boards, you can expect to see stats for your favorite monster in here too. Enjoy!